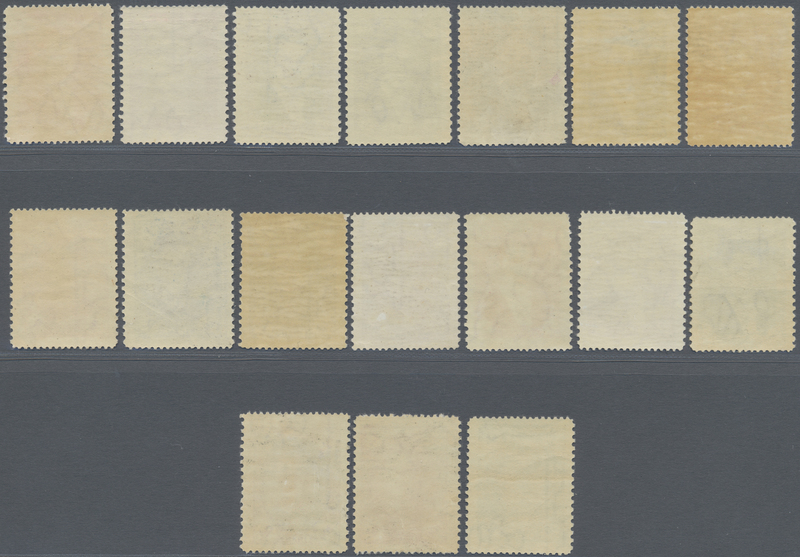 8480 postfrisch (never hinged) ** ungebraucht (hinged) * Sc. 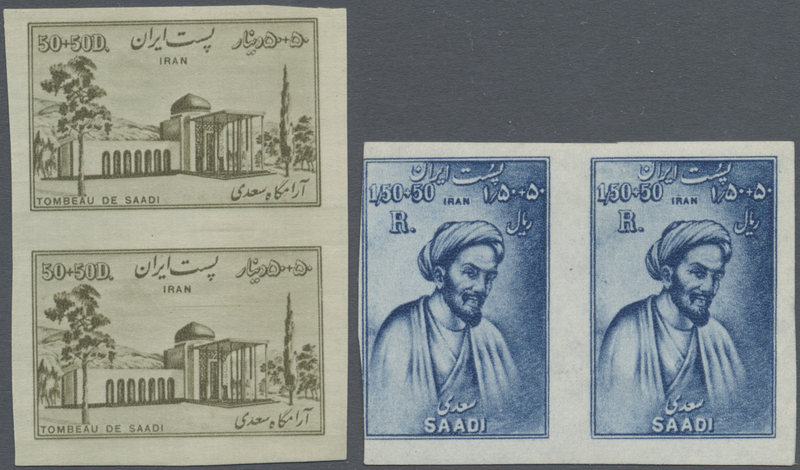 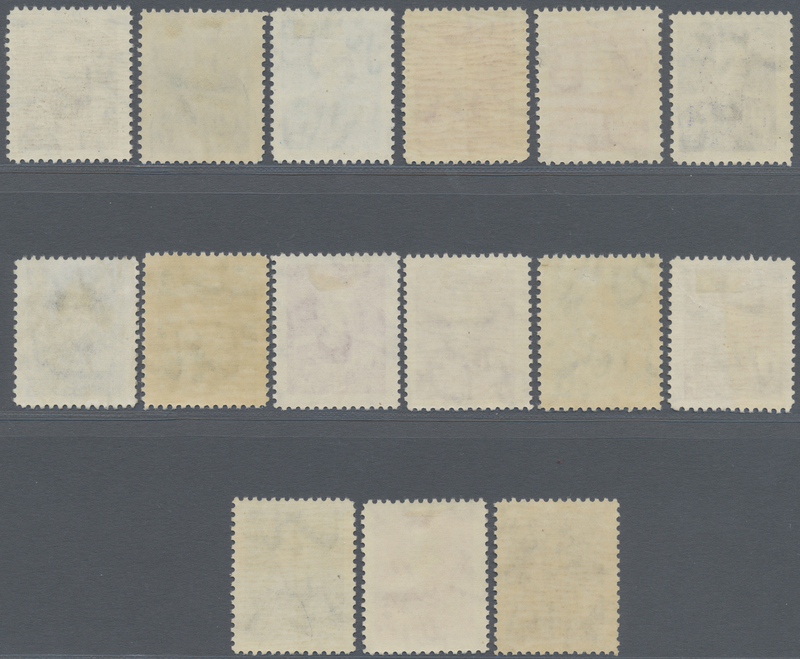 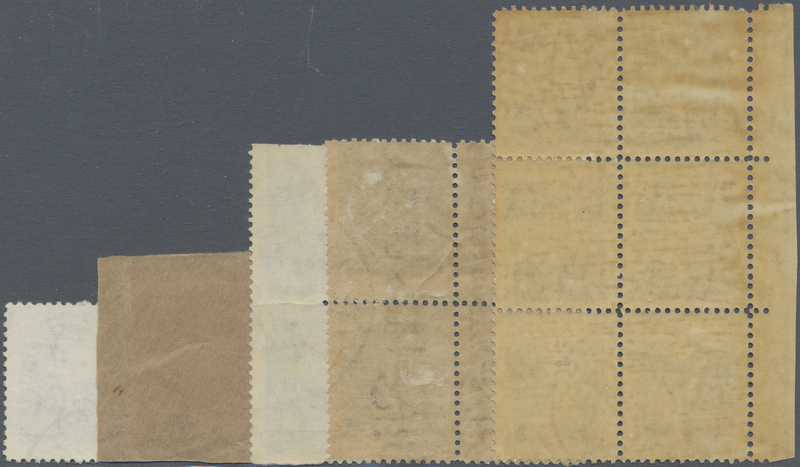 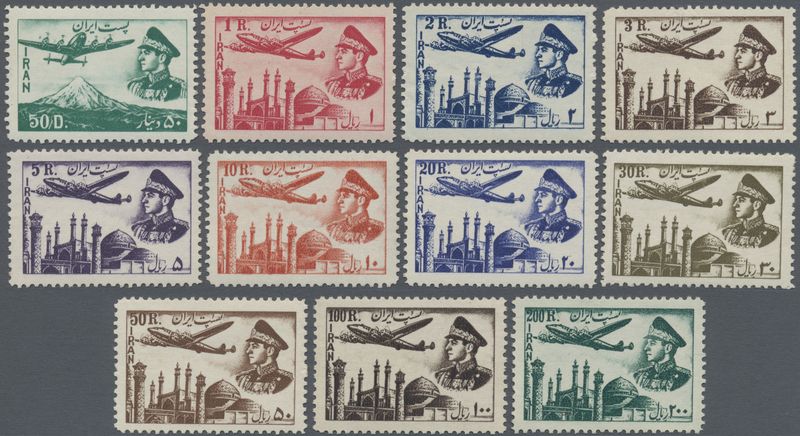 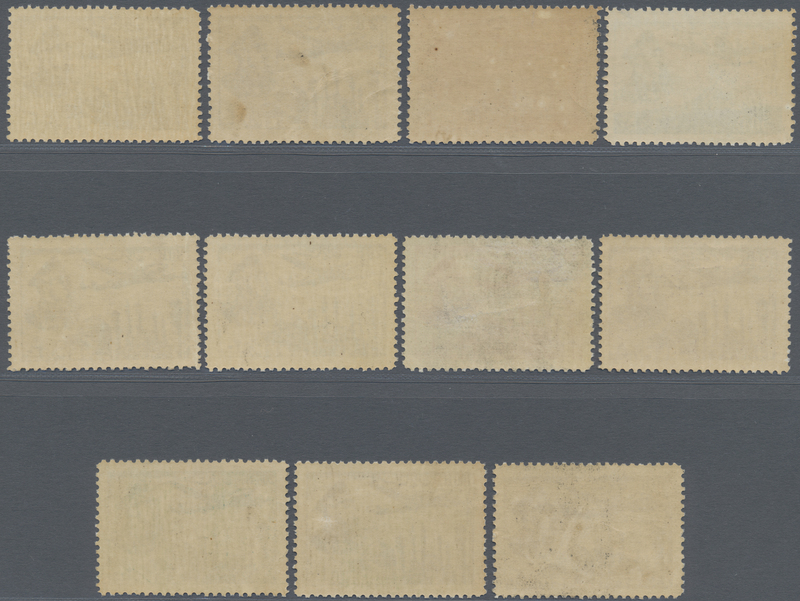 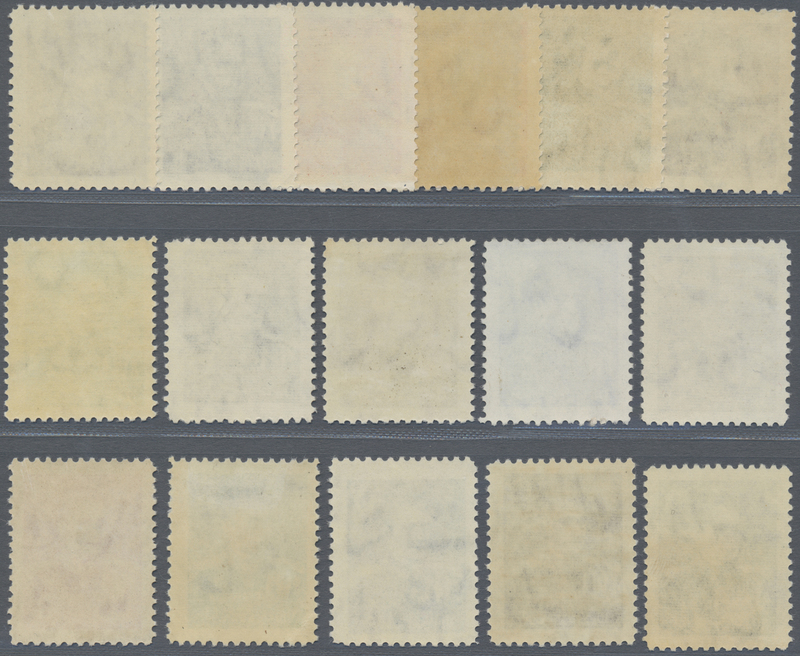 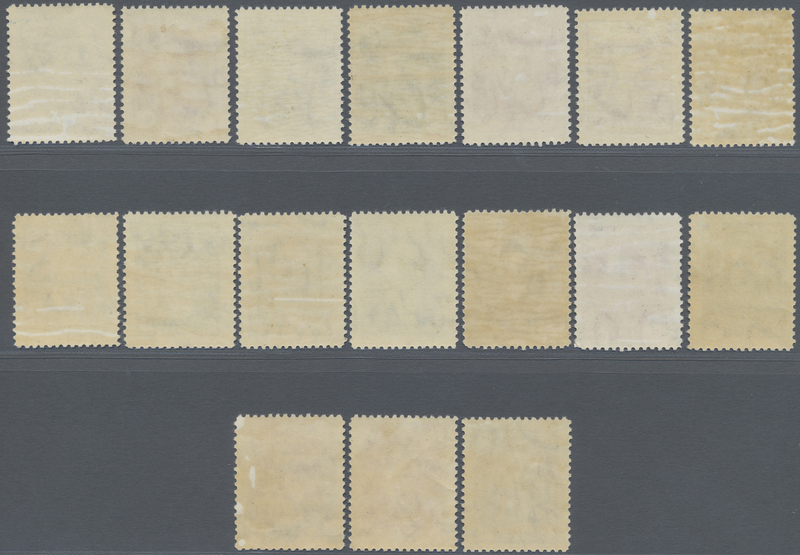 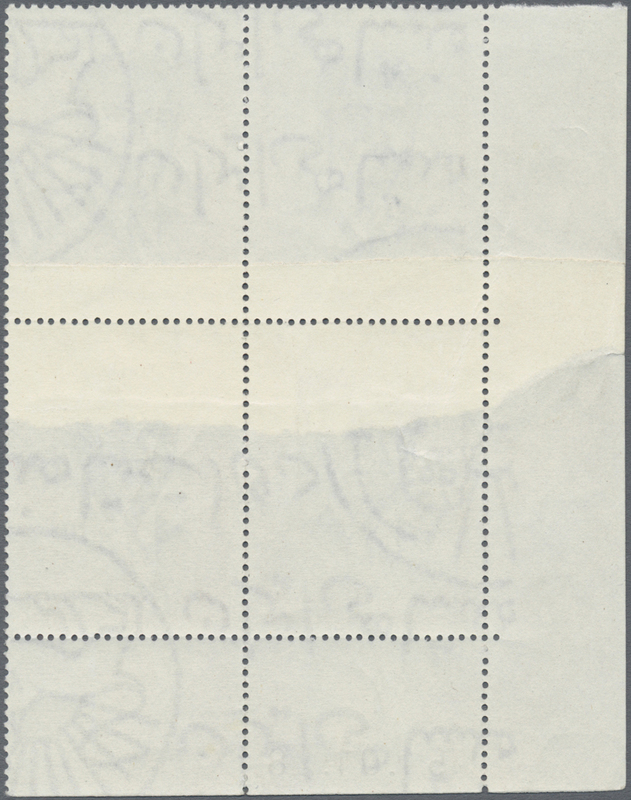 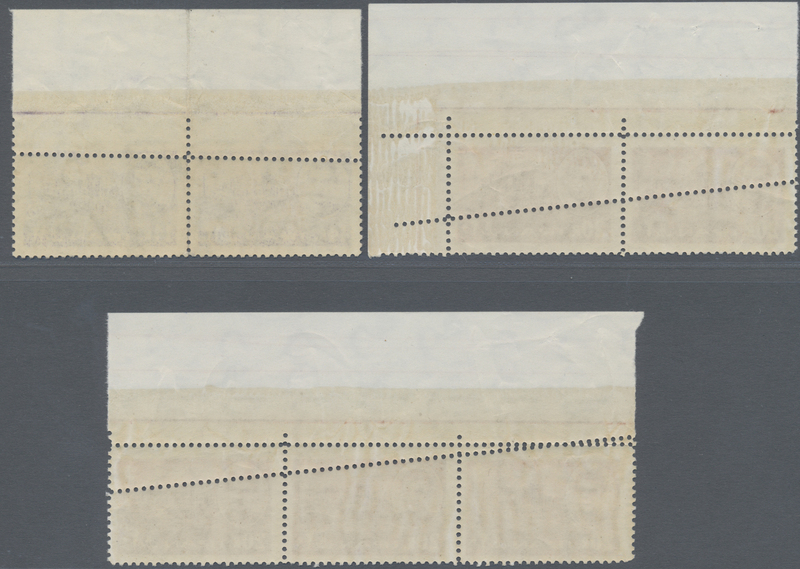 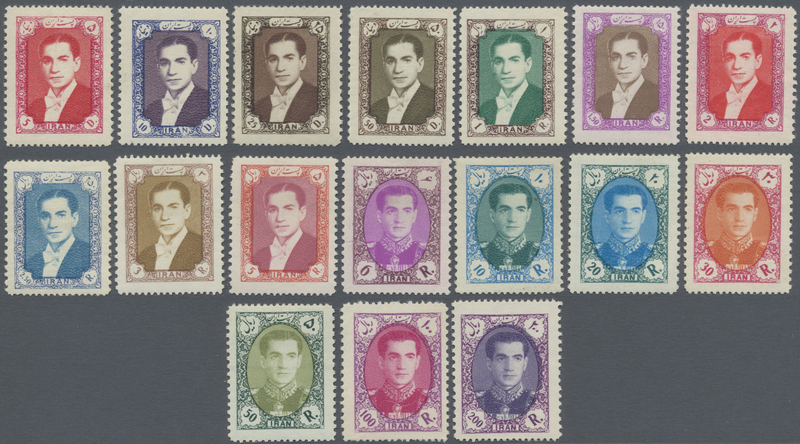 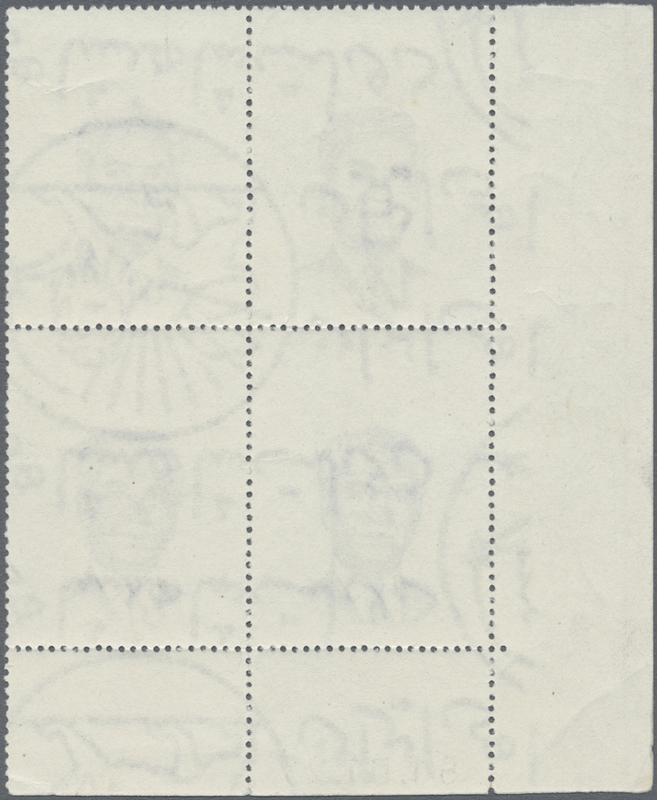 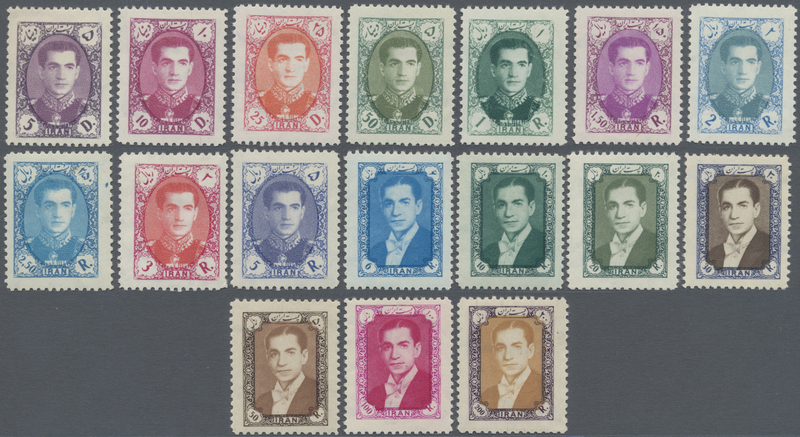 950/65, 975/76 1951/1953, Definitives, 5d.-50r., set of 18 values, mainly unmounted mint, few imperfections. 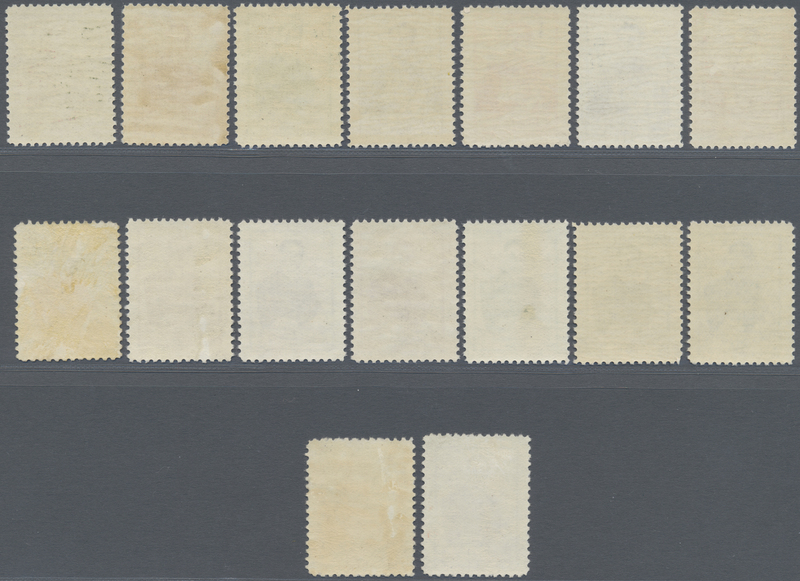 8485 postfrisch (never hinged) ** ungebraucht (hinged) * Sc. 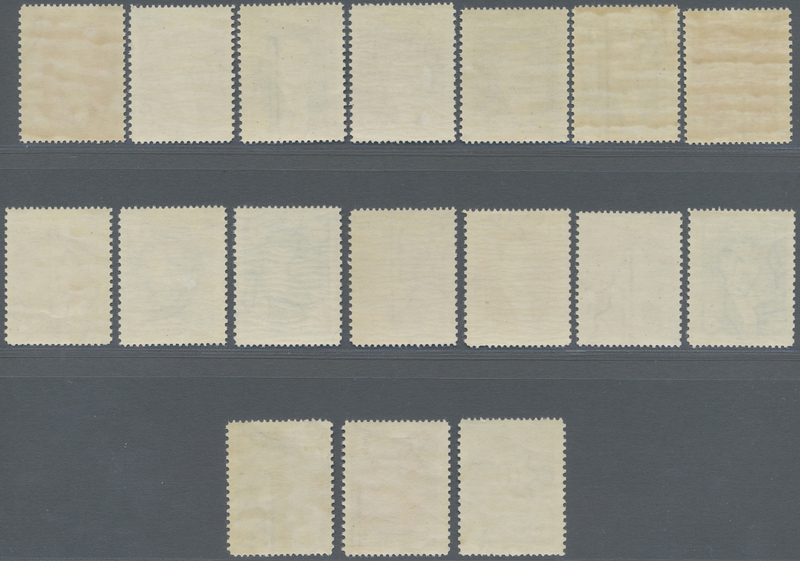 C68/78 1953, Airmails, 50d.-200r., complete set of eleven values, mint original gum. 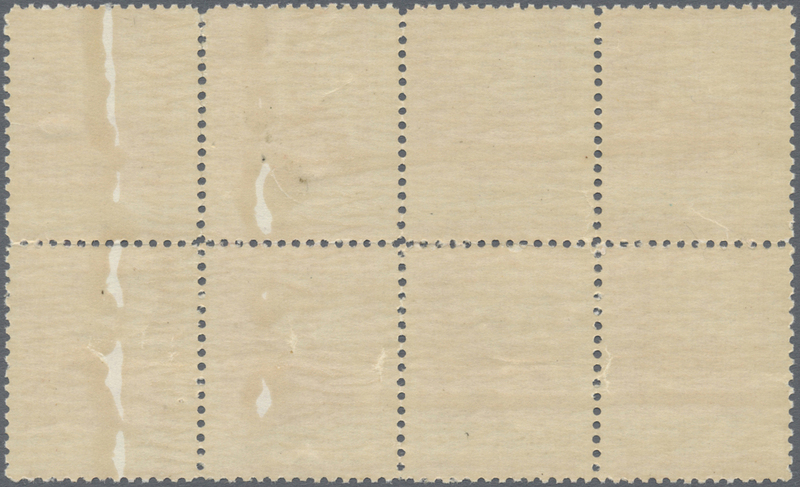 8486 postfrisch (never hinged) ** ungebraucht (hinged) * Sc. 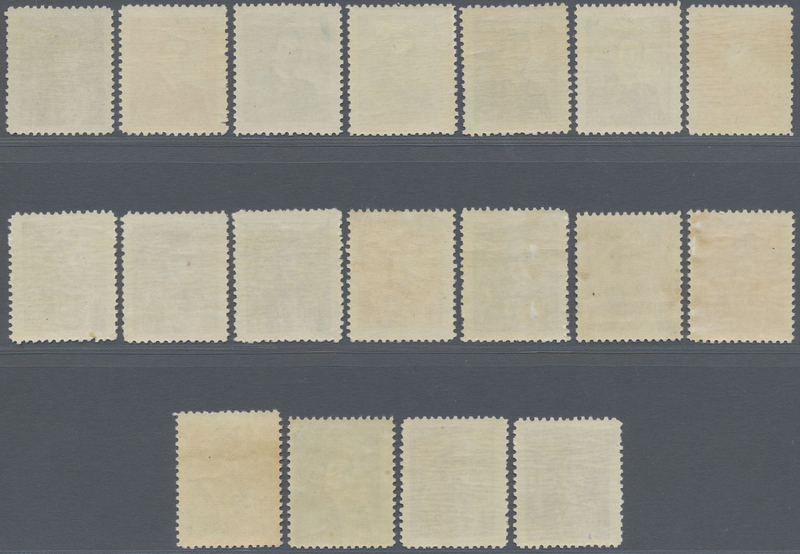 999/1014 1954, Definitives, 5d.-200r., complete set of 16 values, mint original gum. 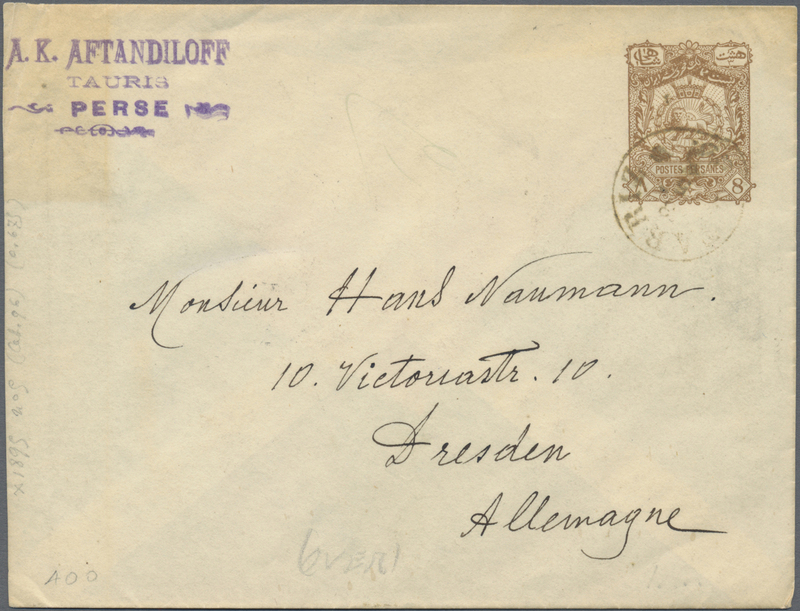 8487 ungebraucht (hinged) * postfrisch (never hinged) ** Sc. 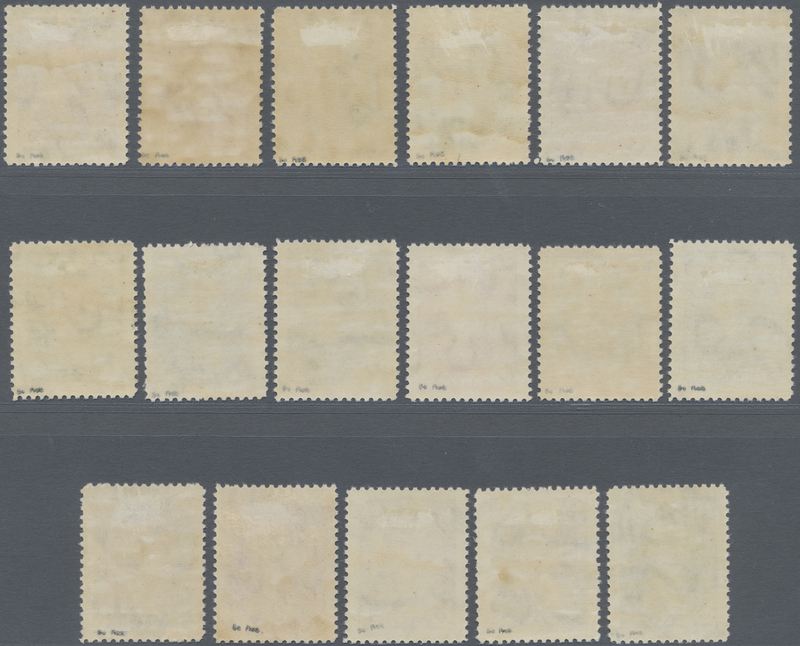 999/1012 1954/1955, Definitives, 5d.-50r., set of 14 values, mint original gum. 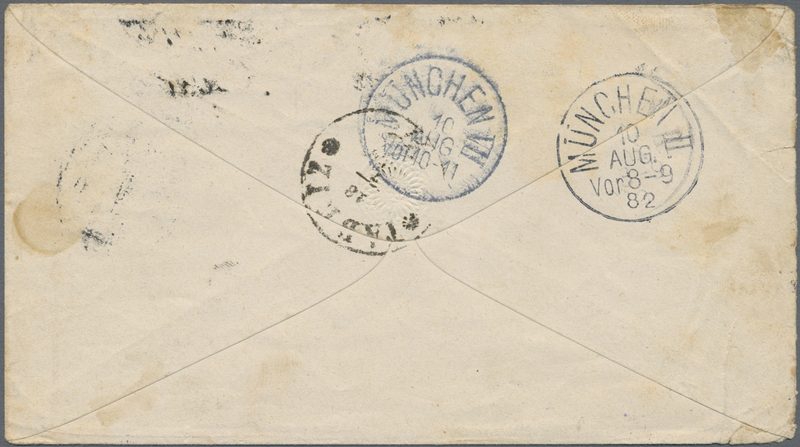 8489 postfrisch (never hinged) ** ungebraucht (hinged) * Sc. 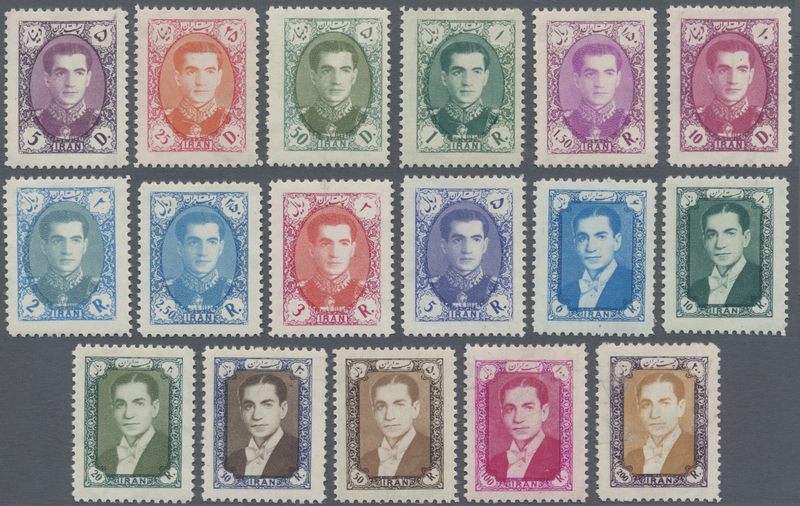 1058A/1072 1956/1957, Definitives, 5d.-200r., complete set of 17 values, mainly unmounted mint. 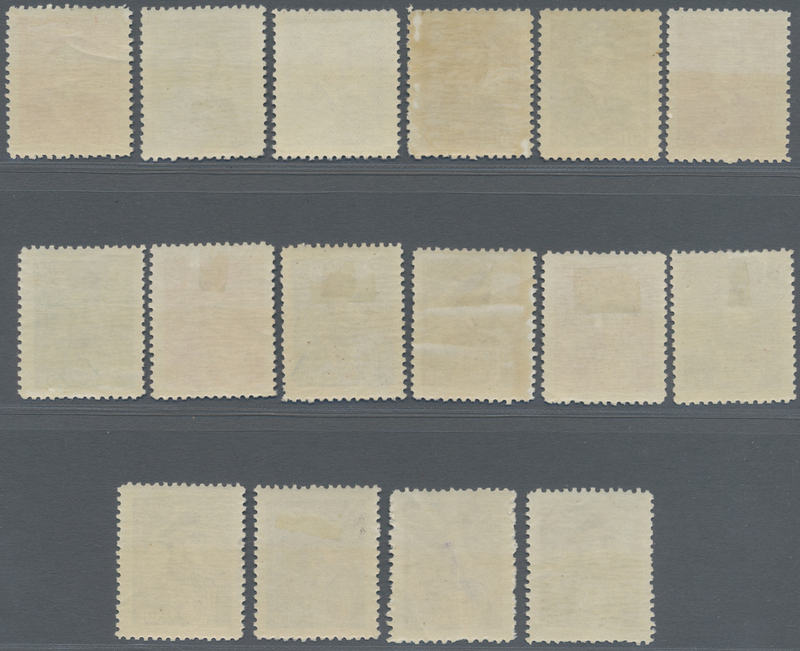 8490 postfrisch (never hinged) ** ungebraucht (hinged) * Sc. 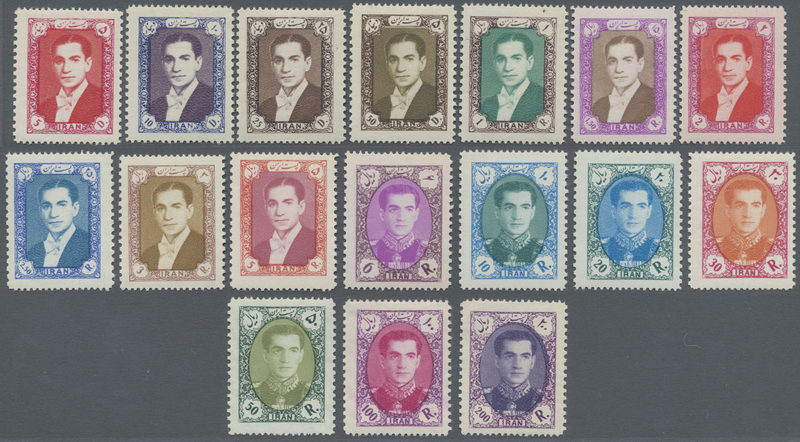 1082/98 1957/1958, Definitives, 5d.-200r., complete set of 17 values, mainly unmounted mint. 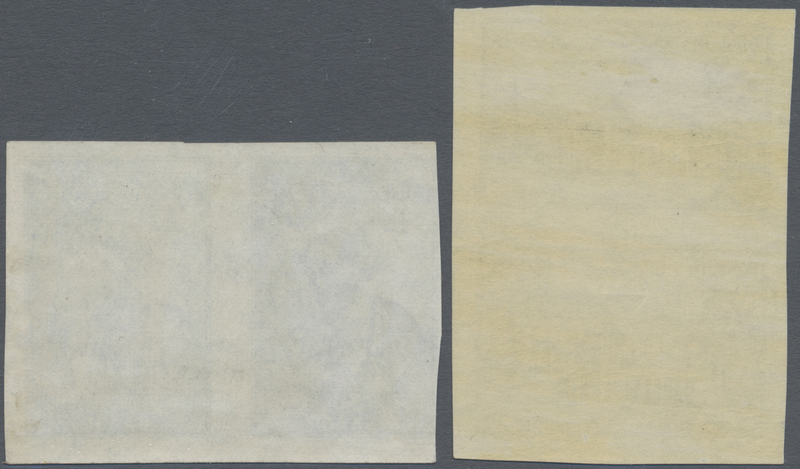 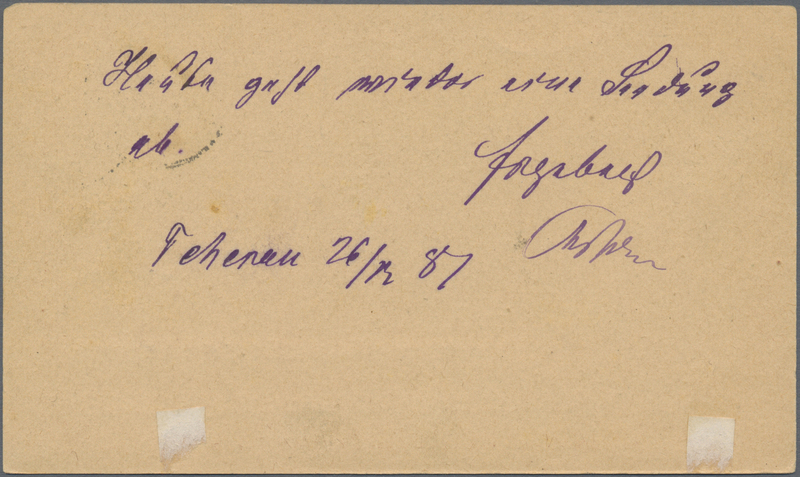 8493 postfrisch (never hinged) ** ungebraucht (hinged) * Sc. 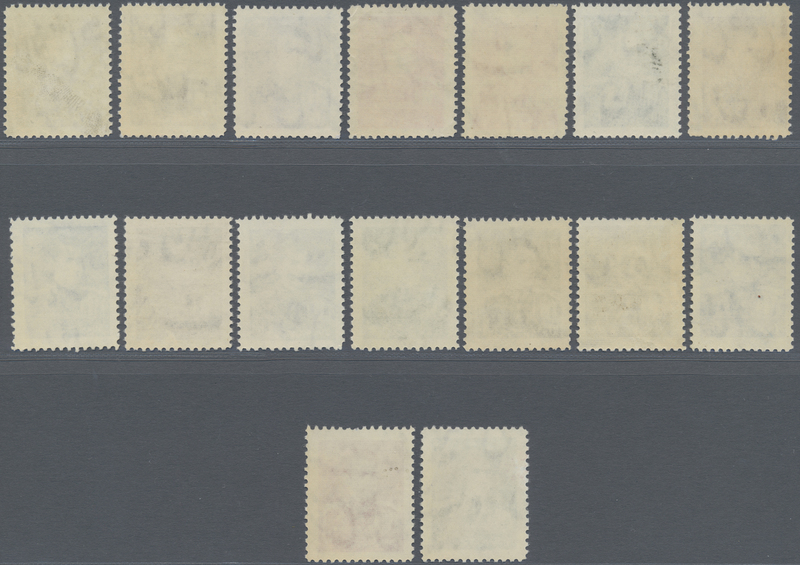 1107/25 1958/1959, Definitives, 5d.-200r., complete set of 15 values, mint original gum. 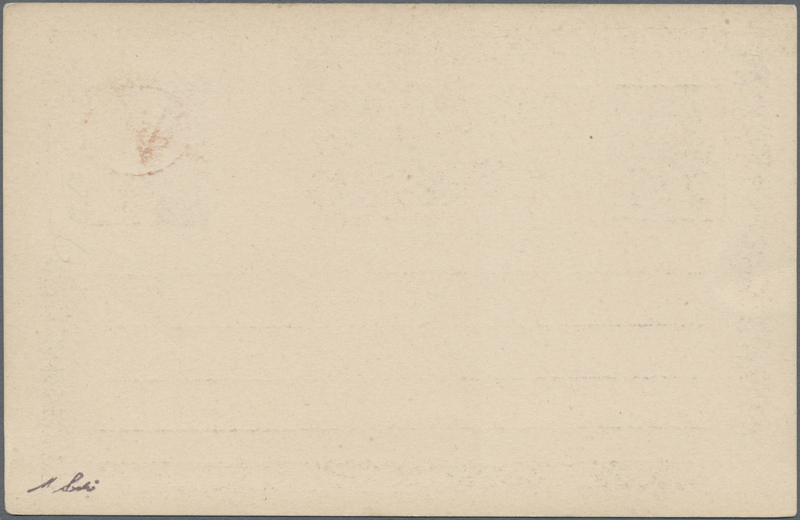 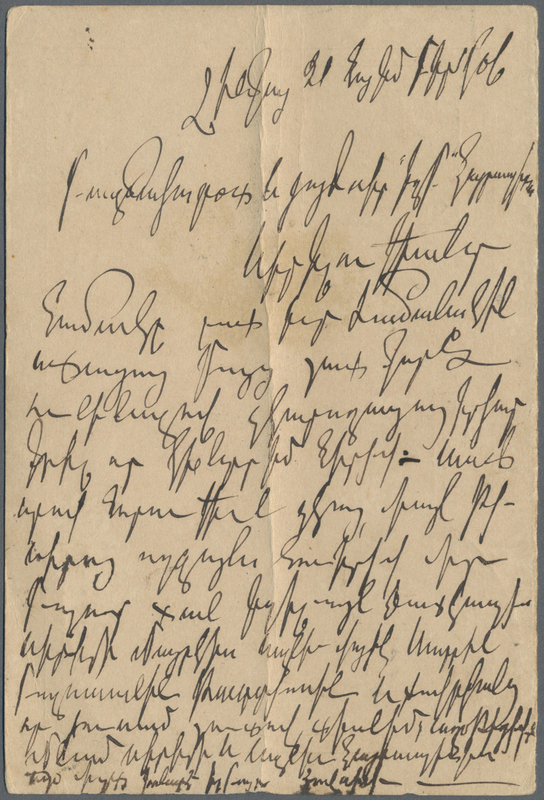 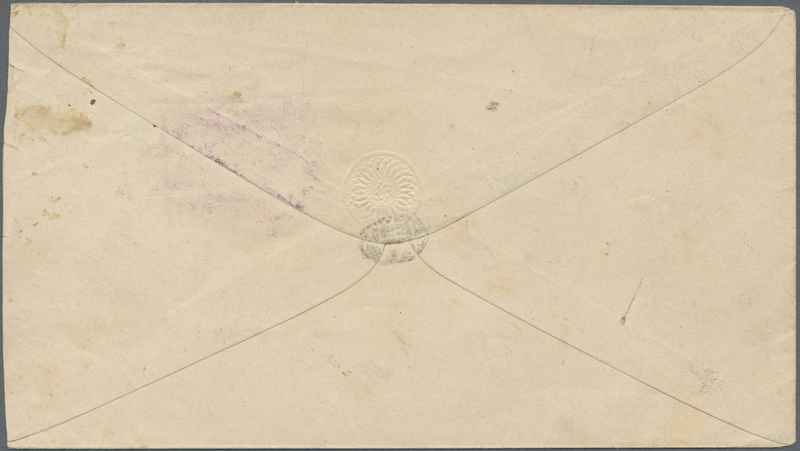 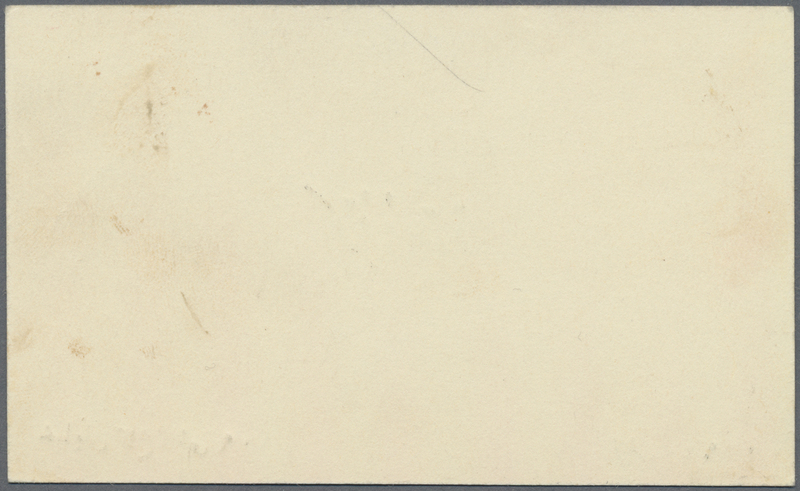 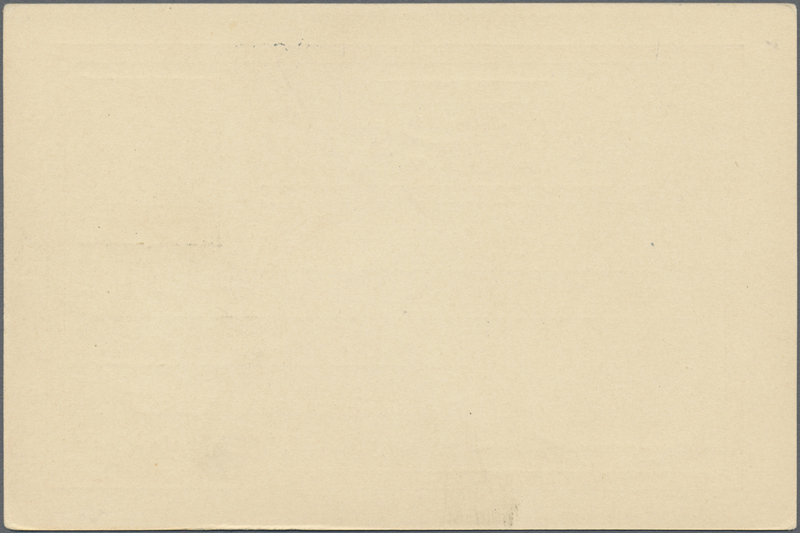 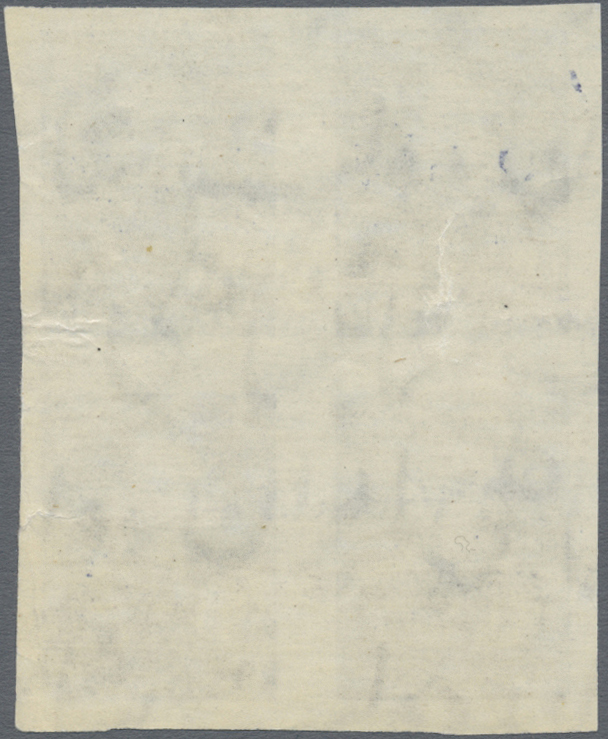 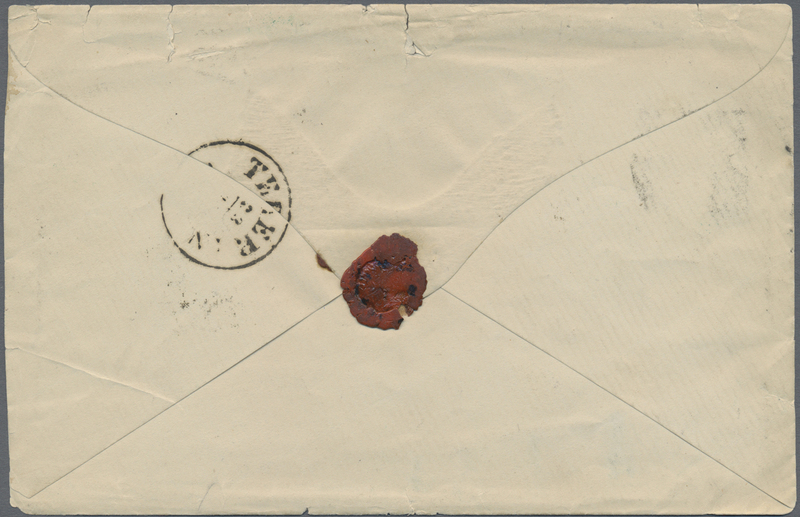 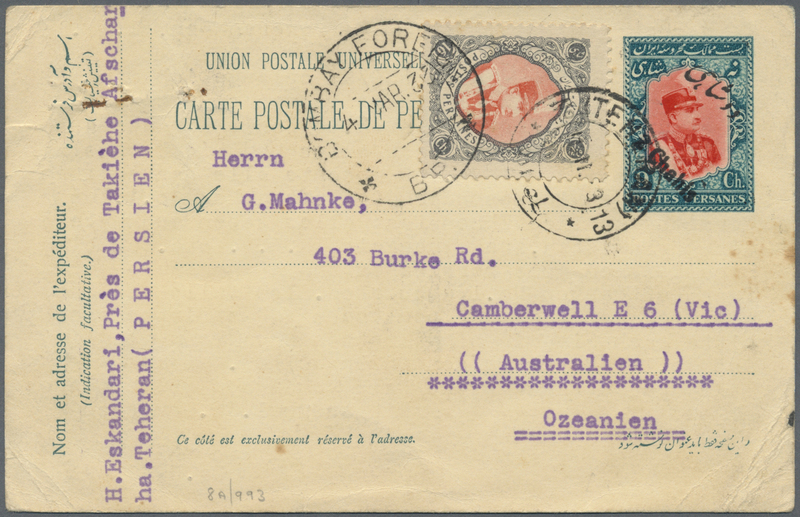 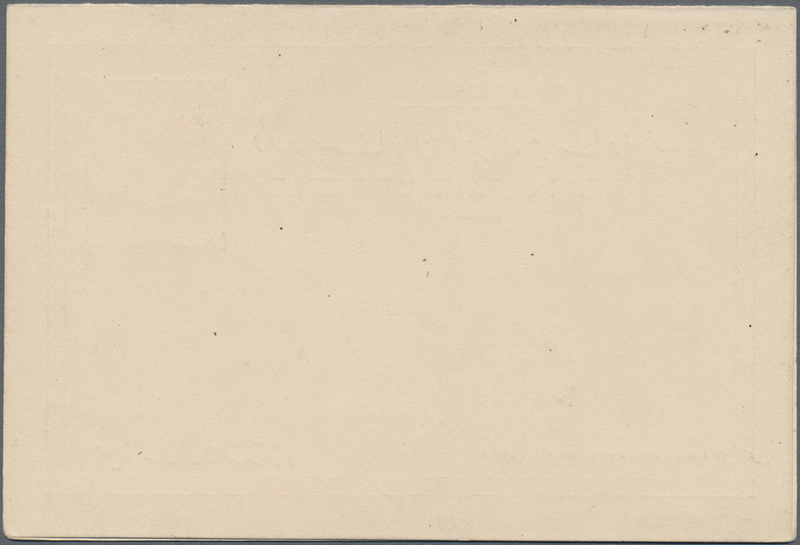 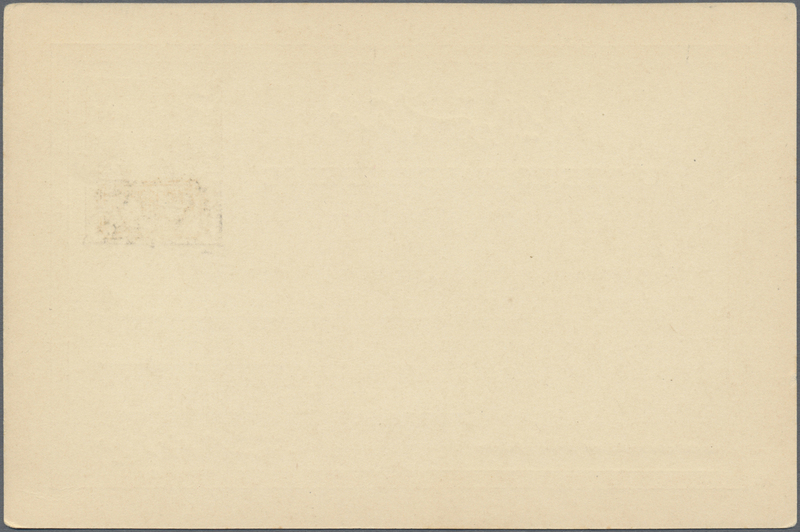 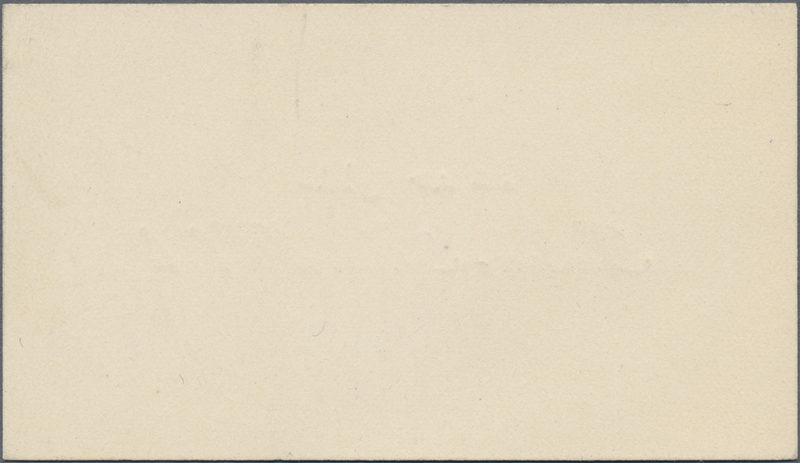 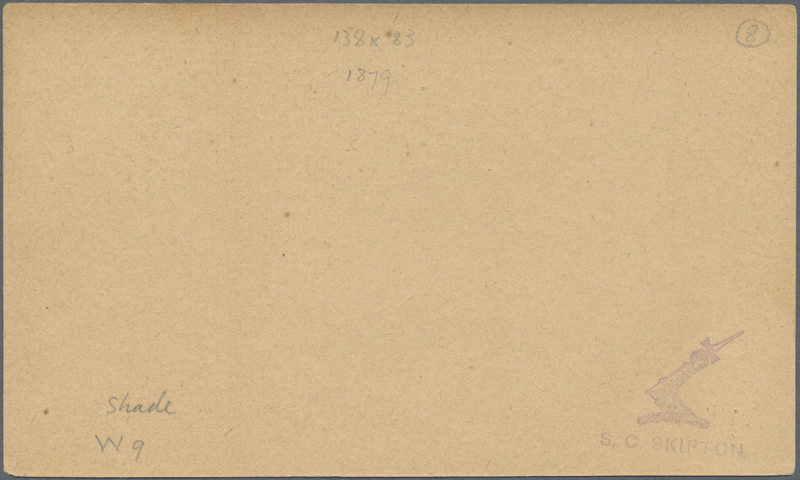 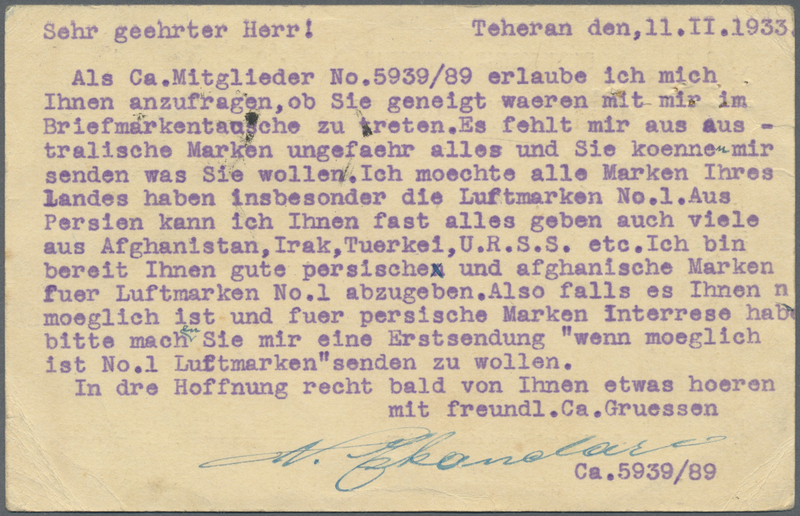 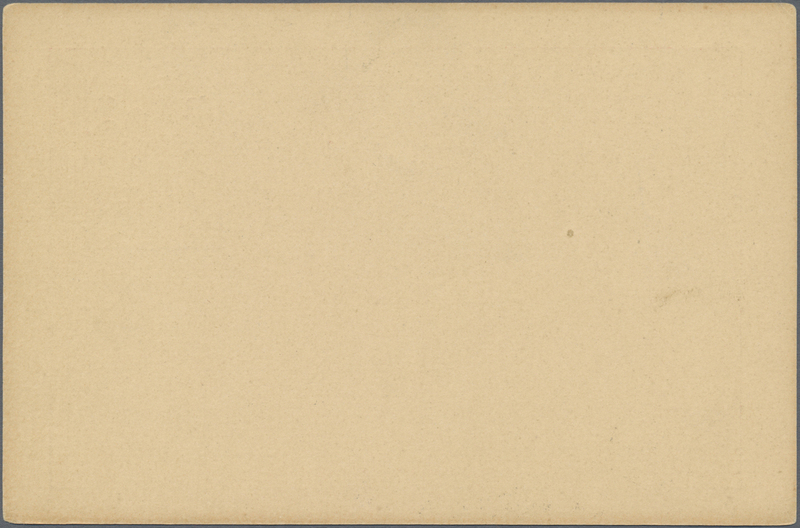 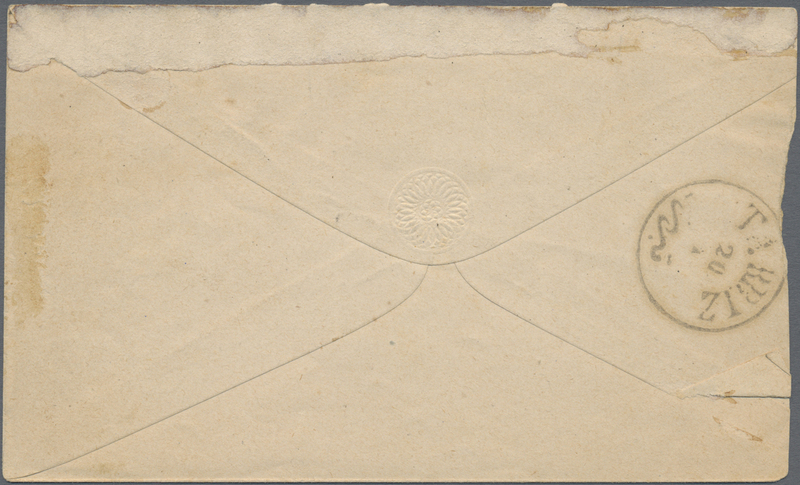 8496 postfrisch (never hinged) ** Sc. 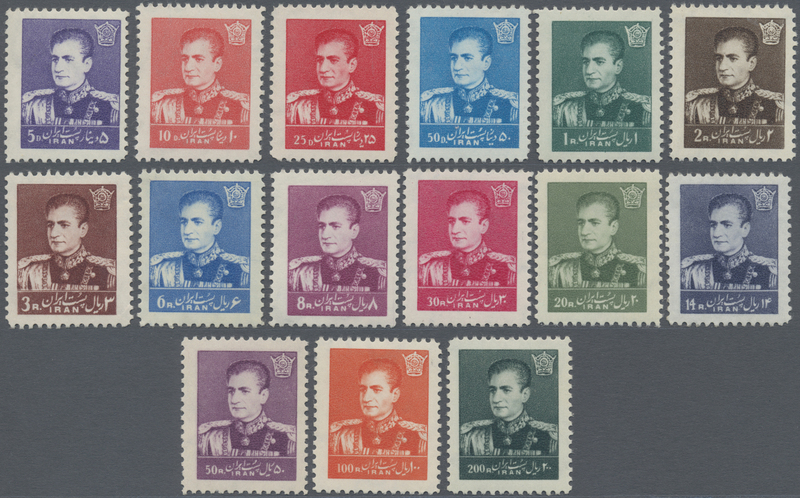 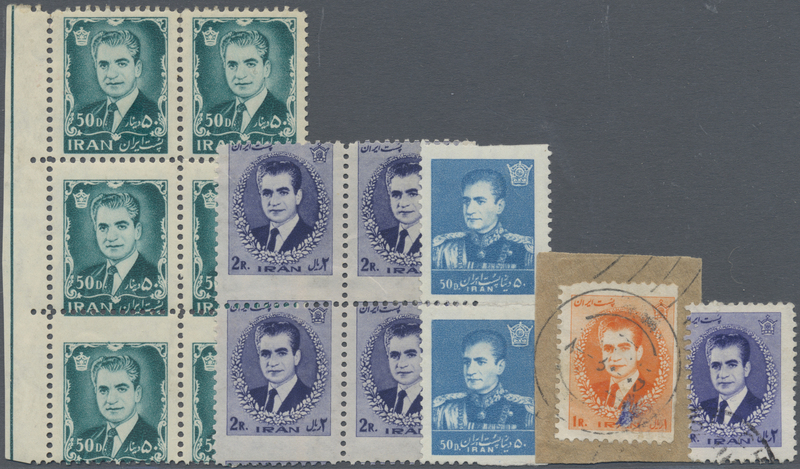 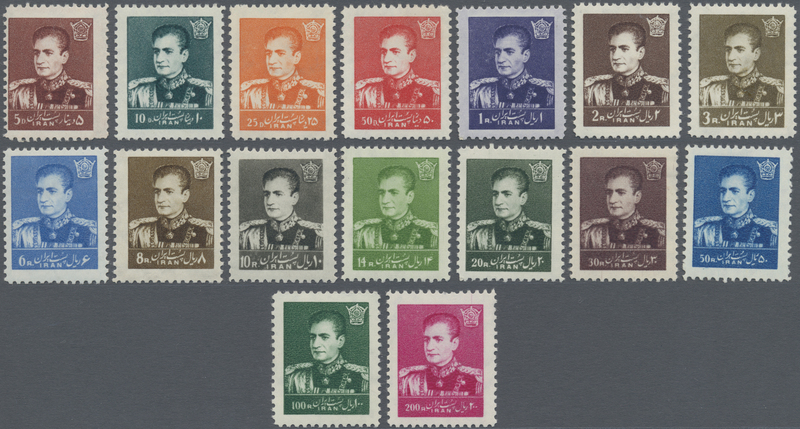 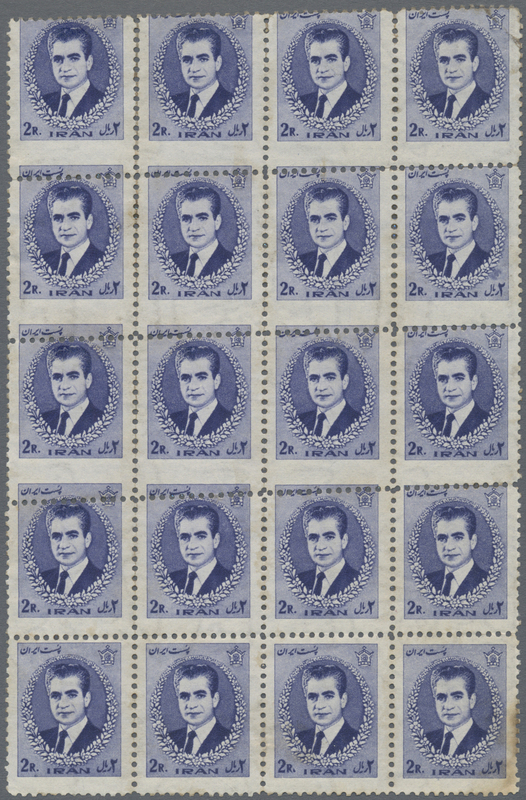 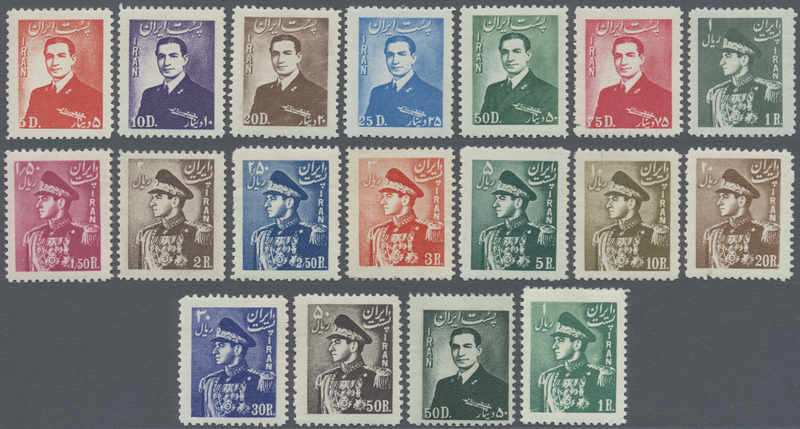 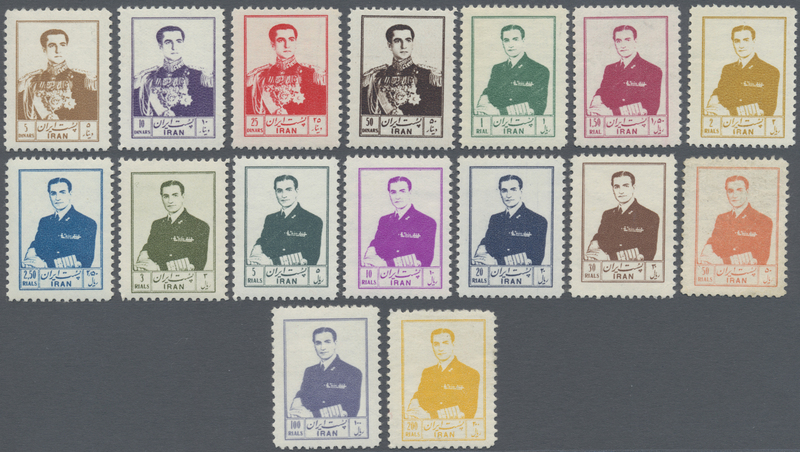 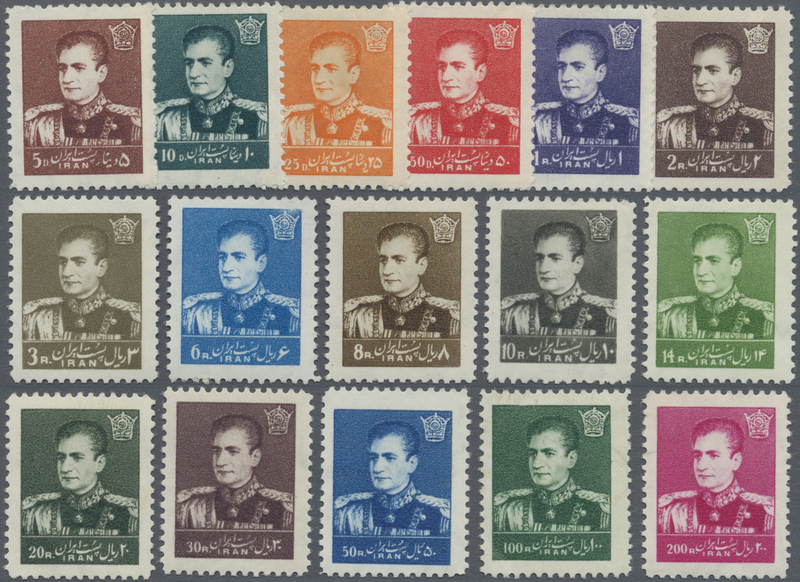 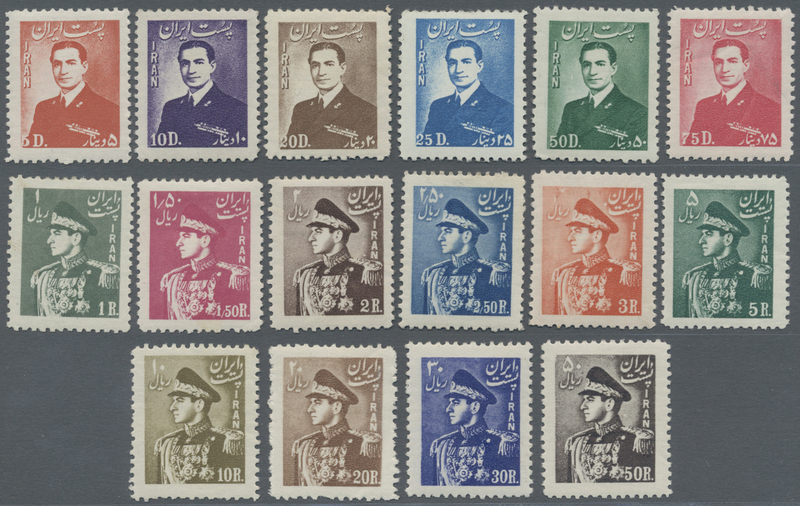 1138/51 1959/1960, Definitives, 5d.-200r., complete set of 16 values, unmounted mint. 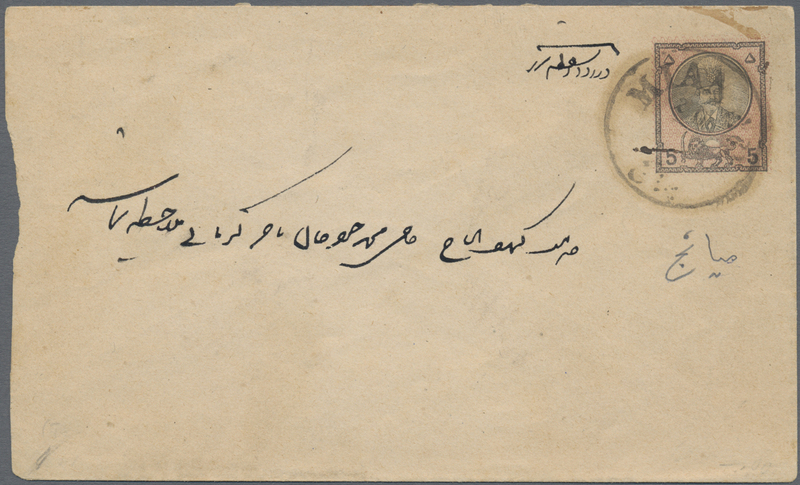 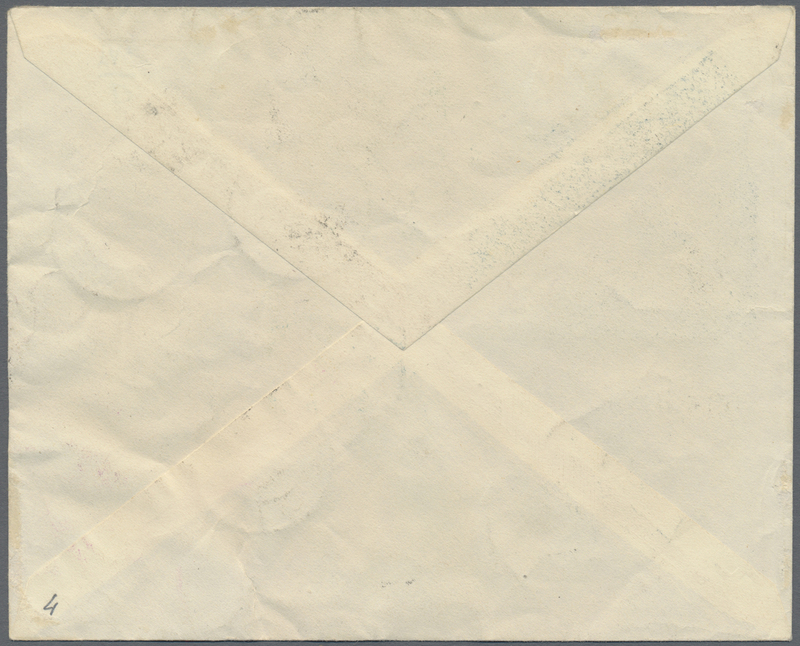 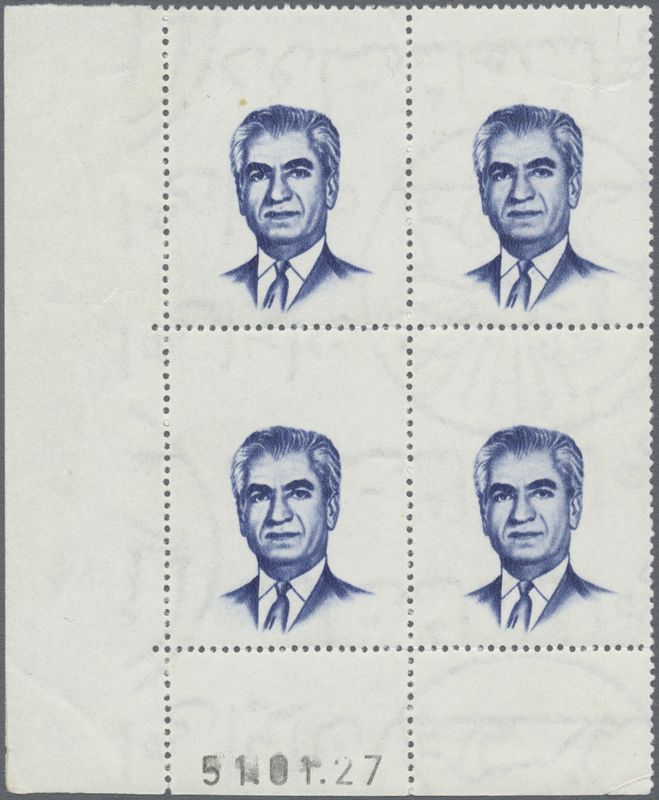 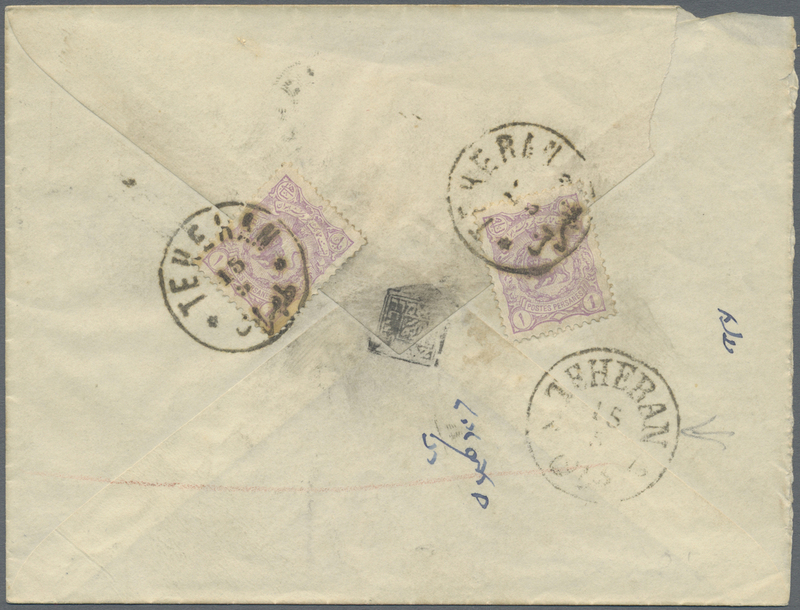 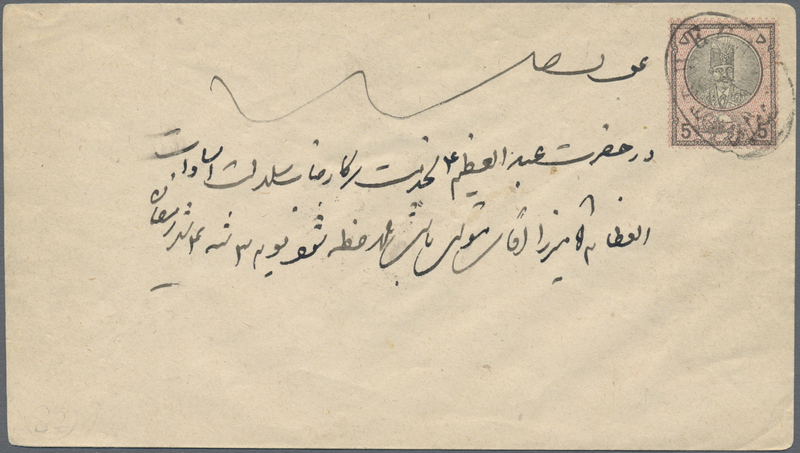 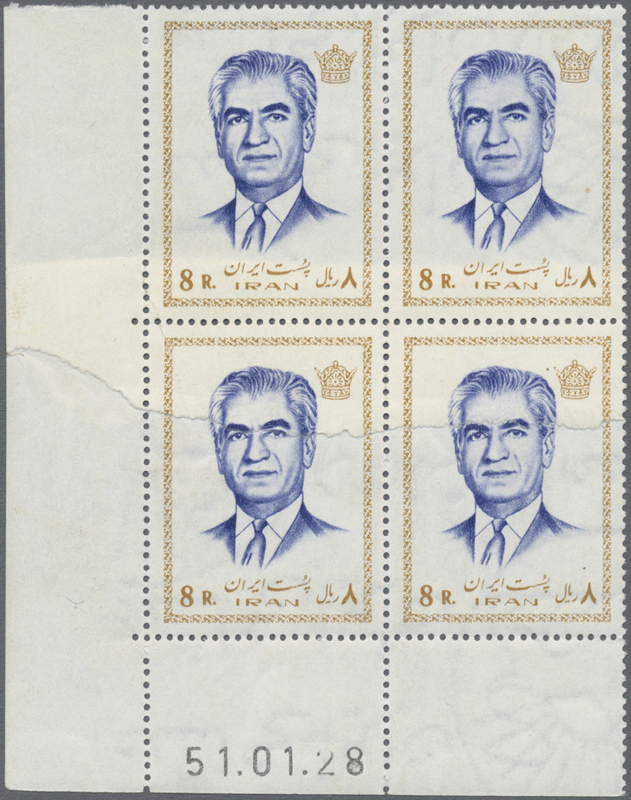 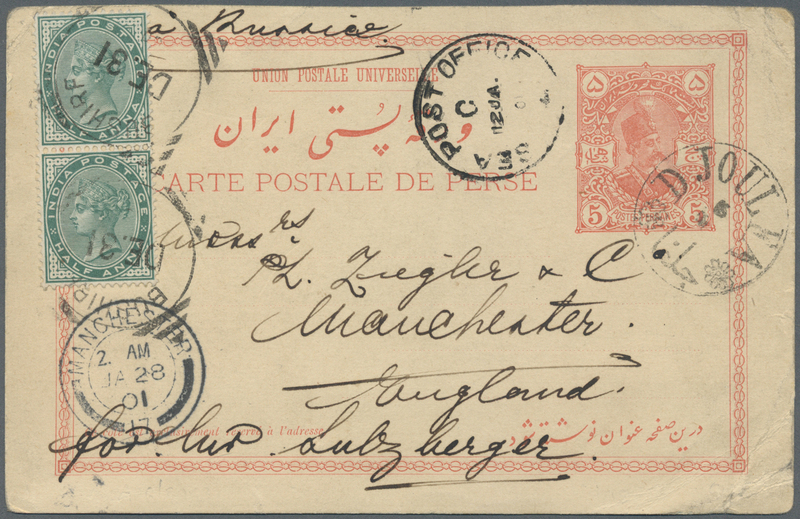 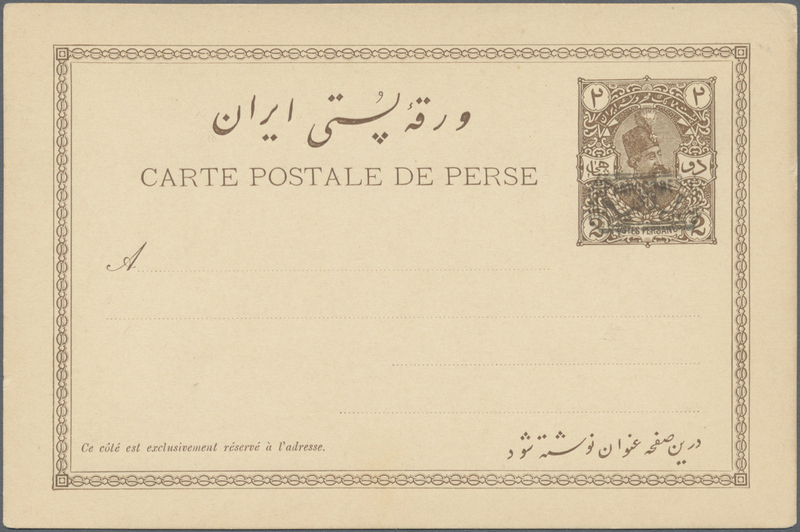 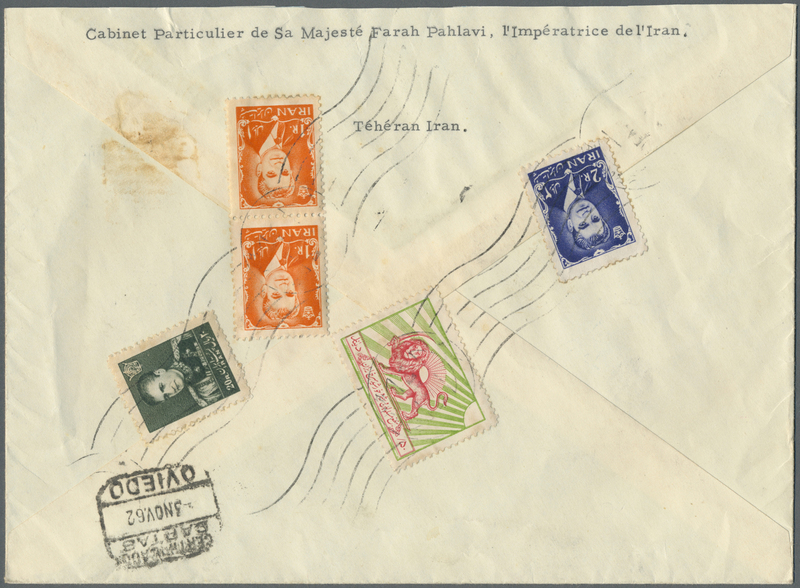 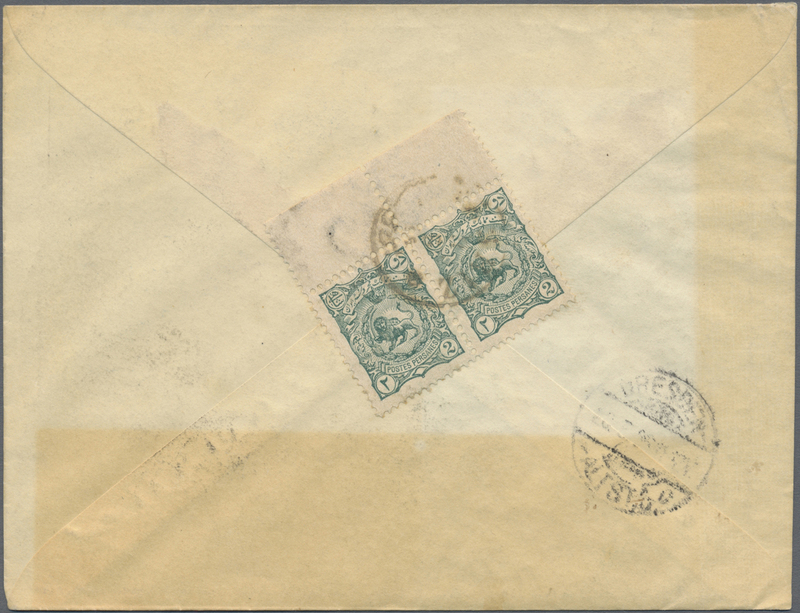 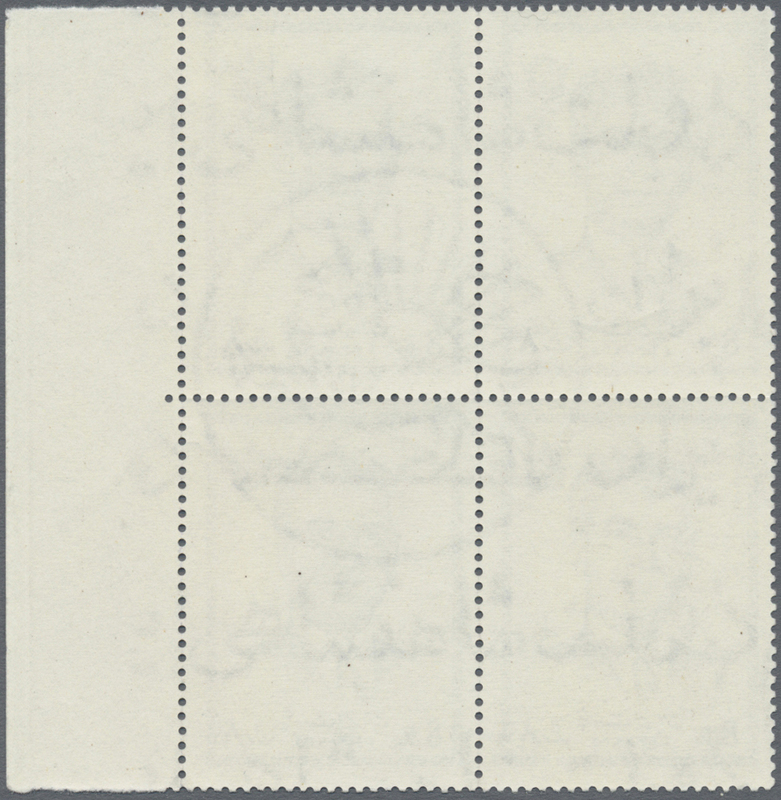 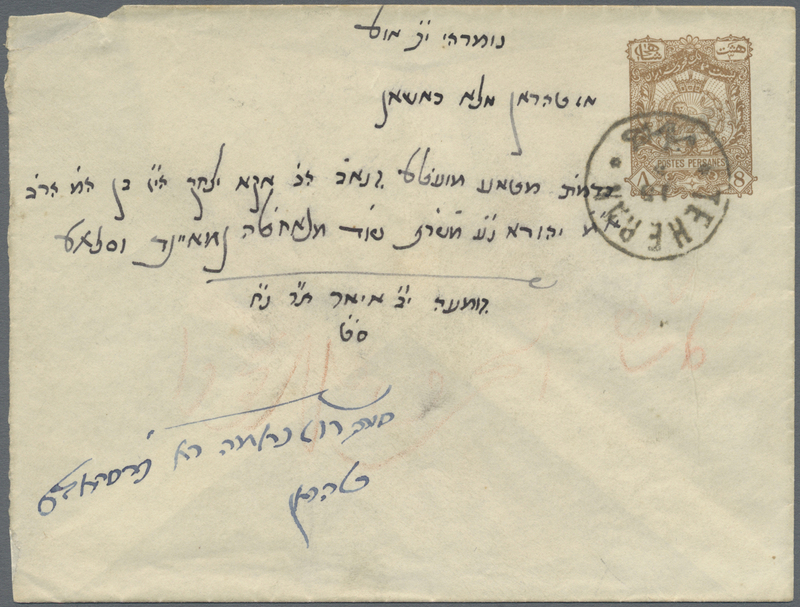 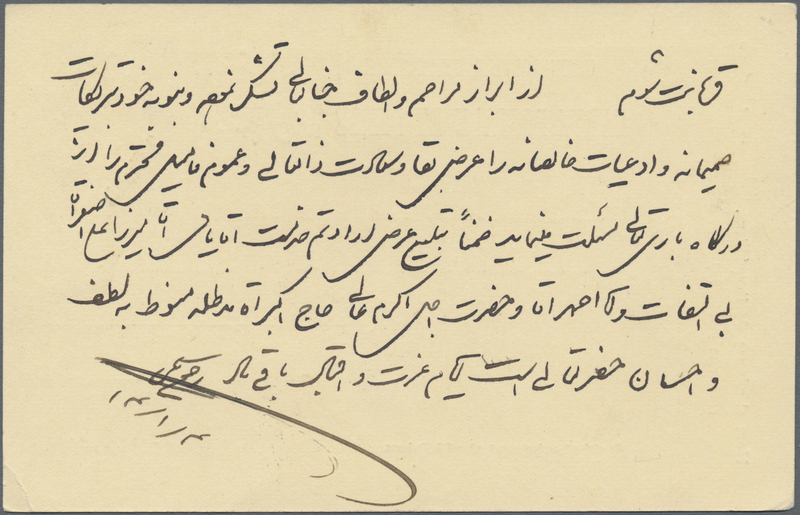 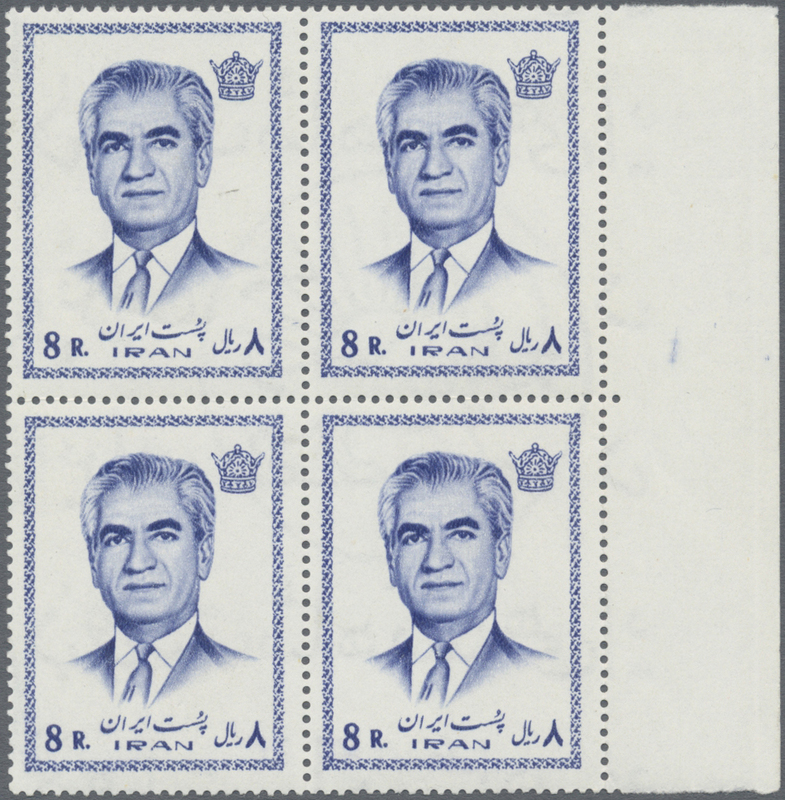 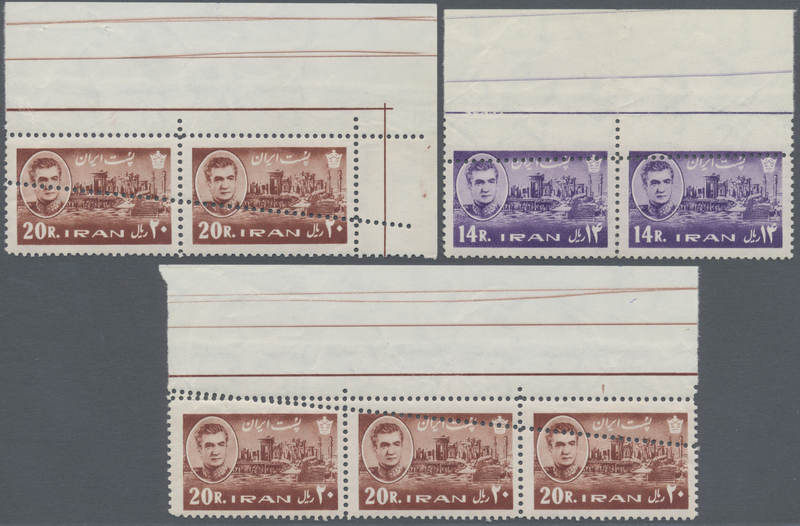 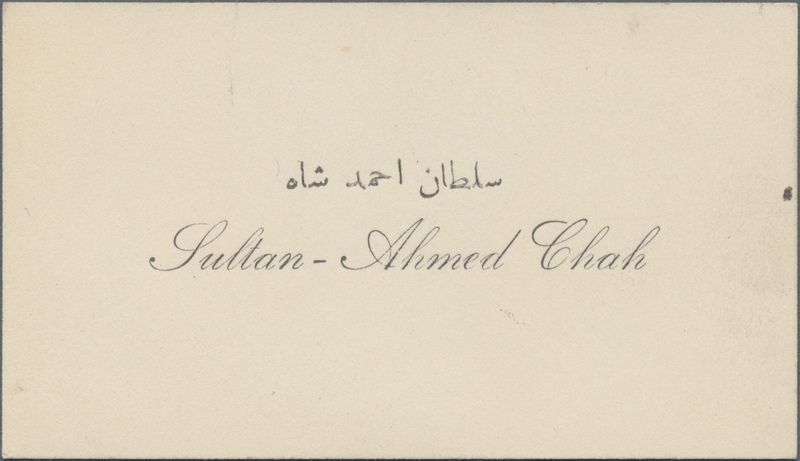 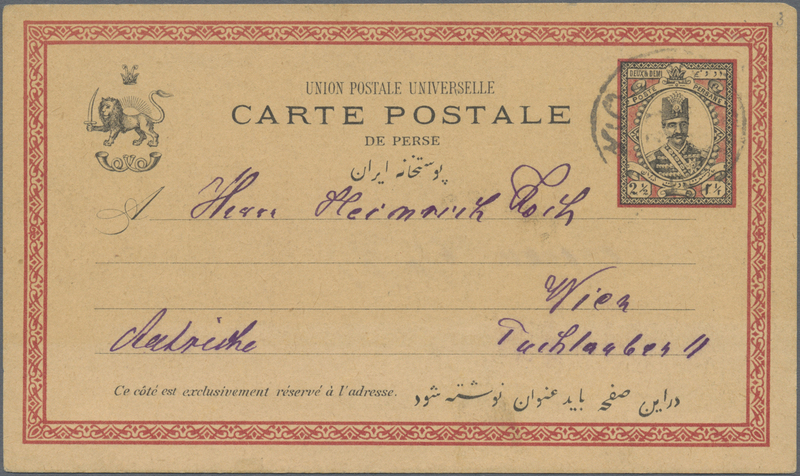 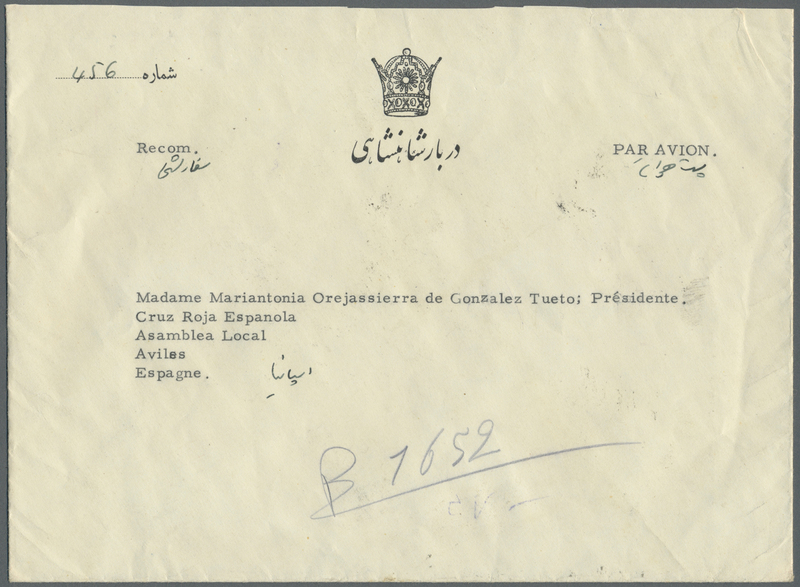 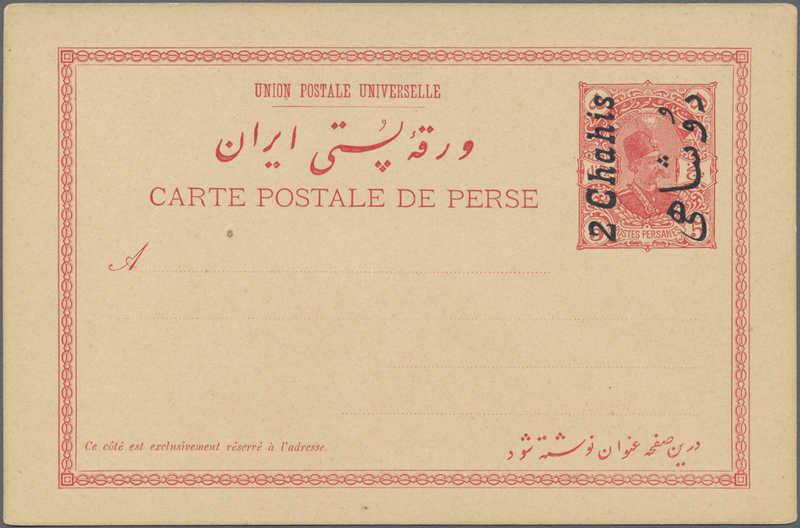 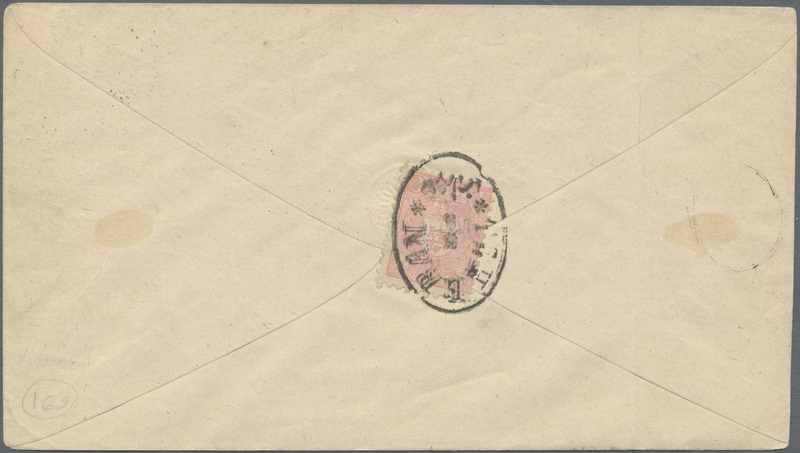 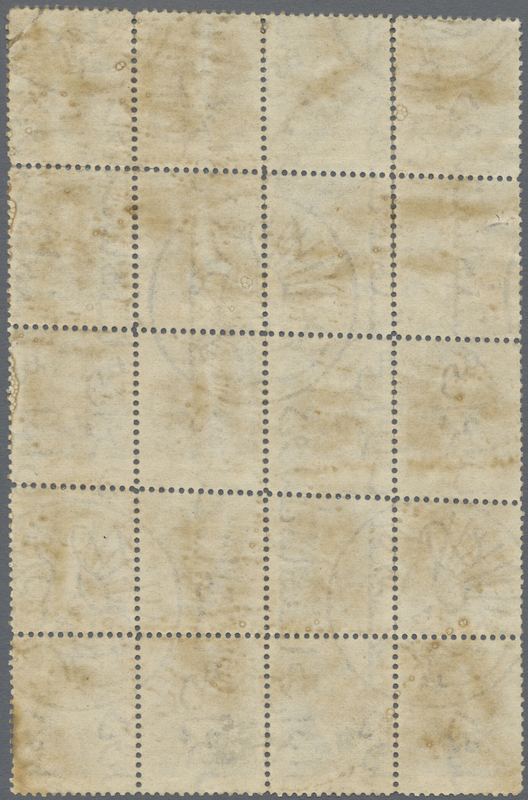 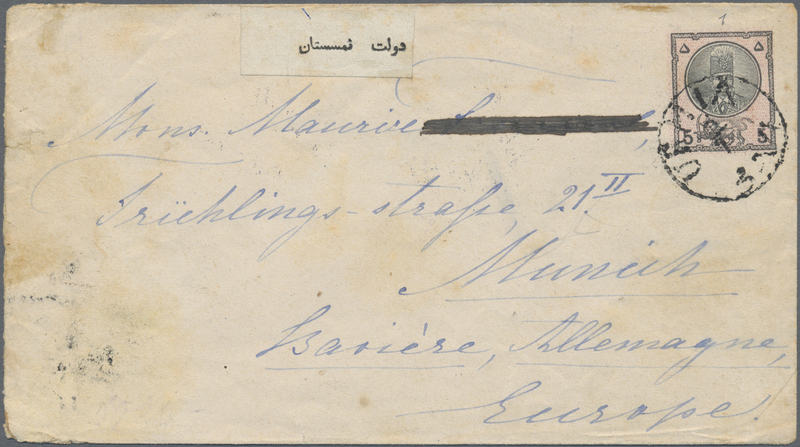 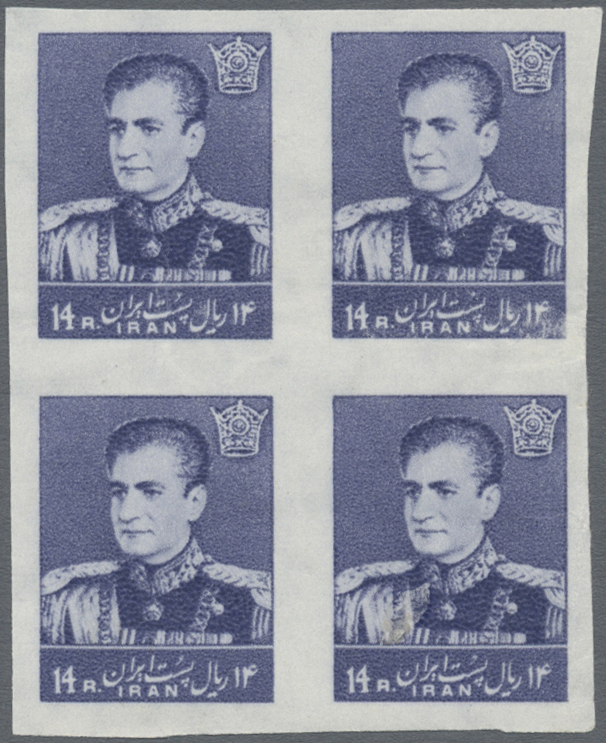 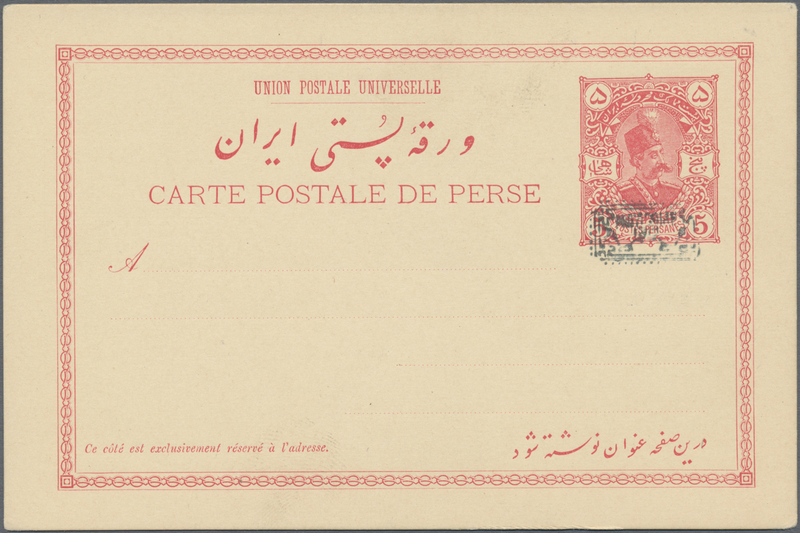 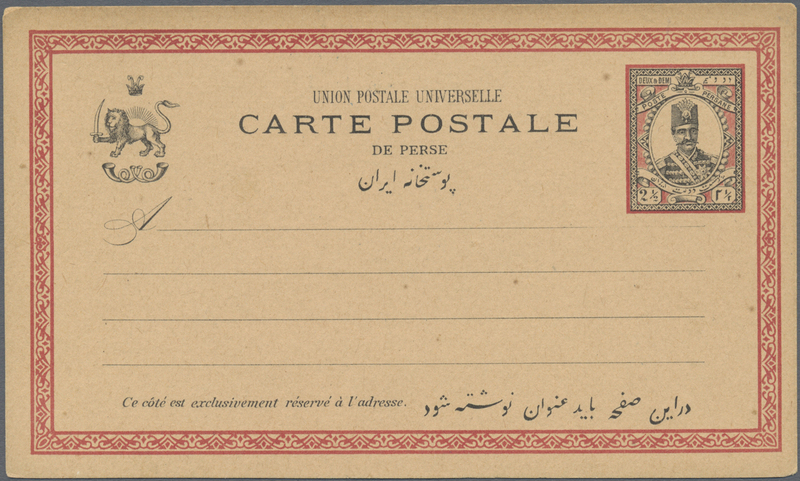 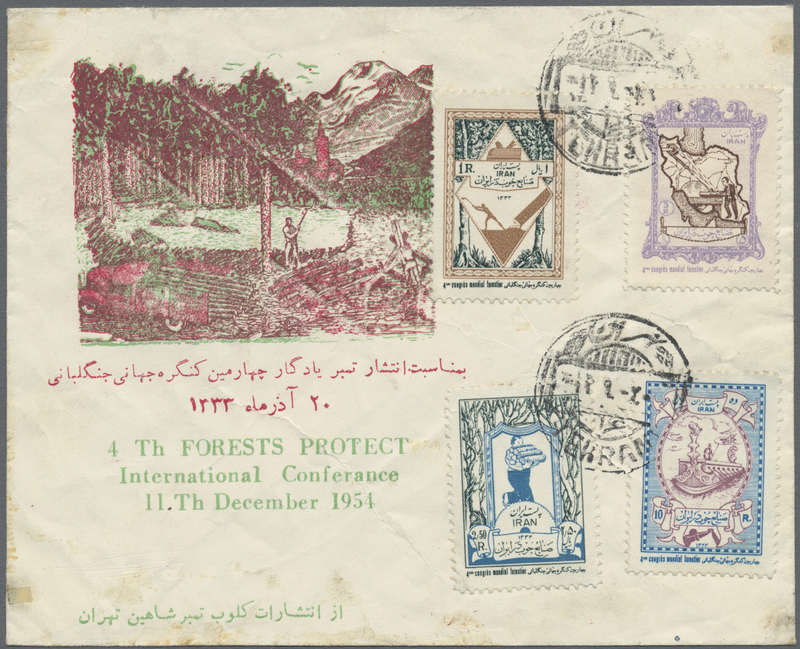 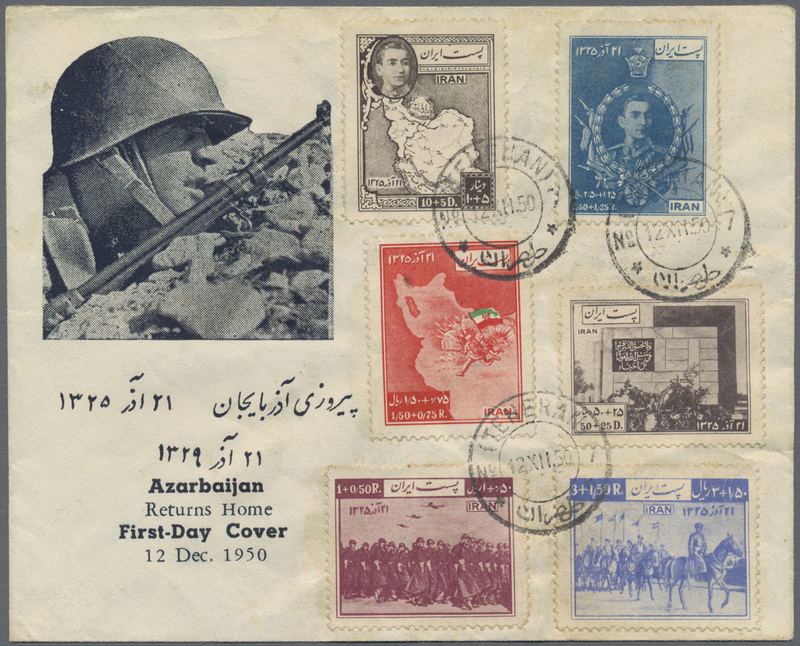 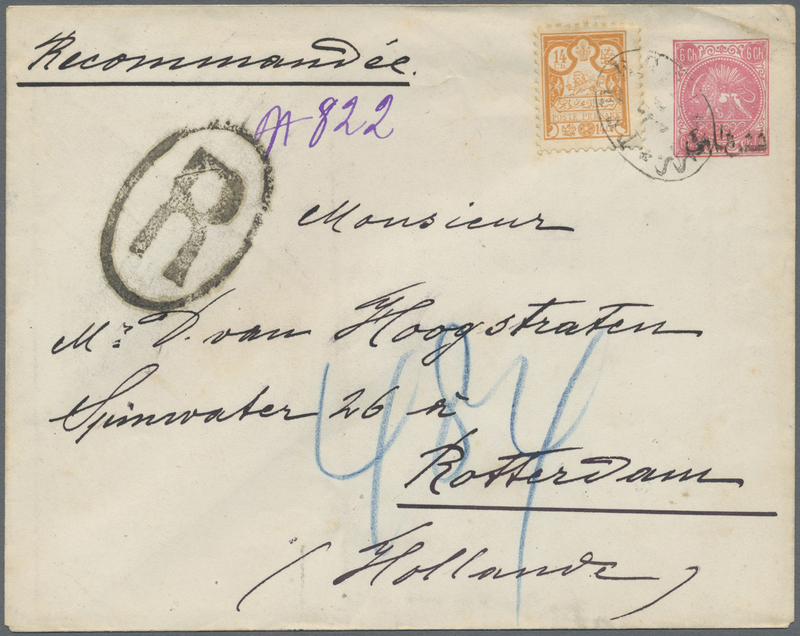 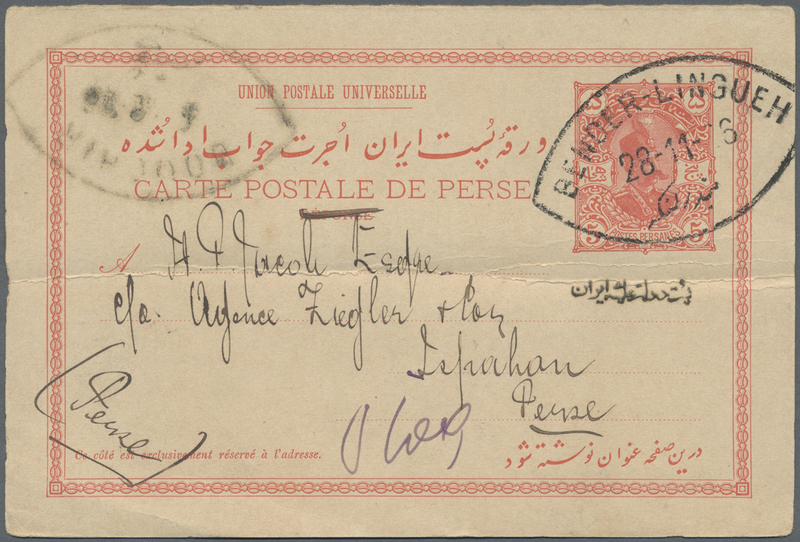 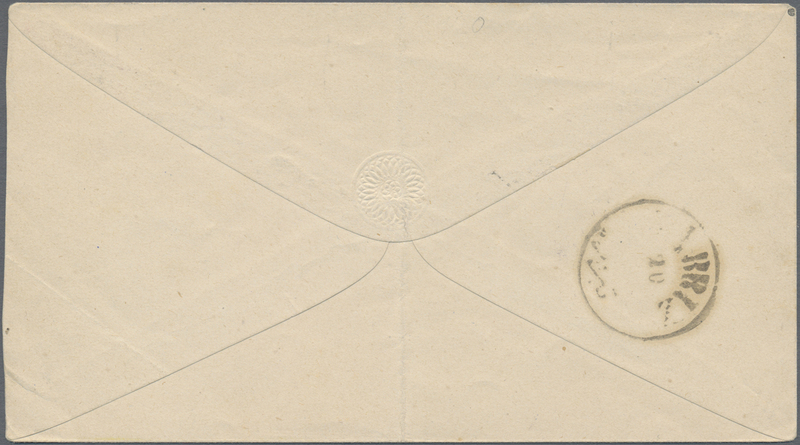 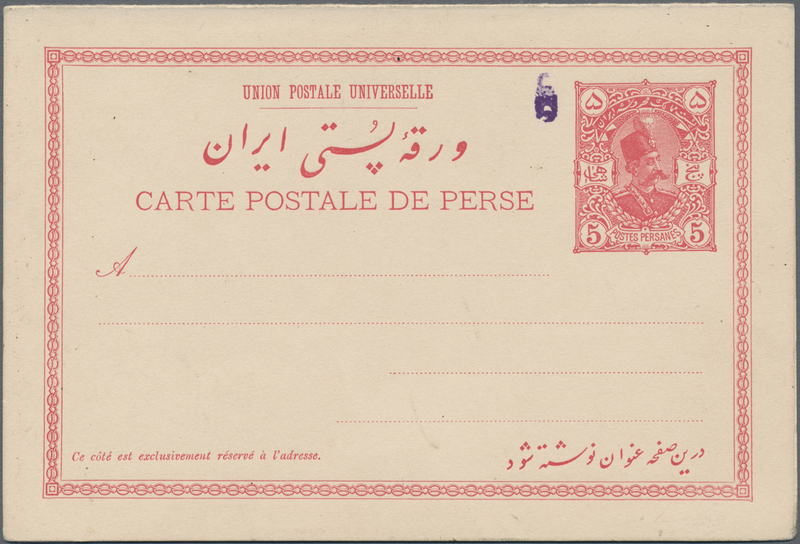 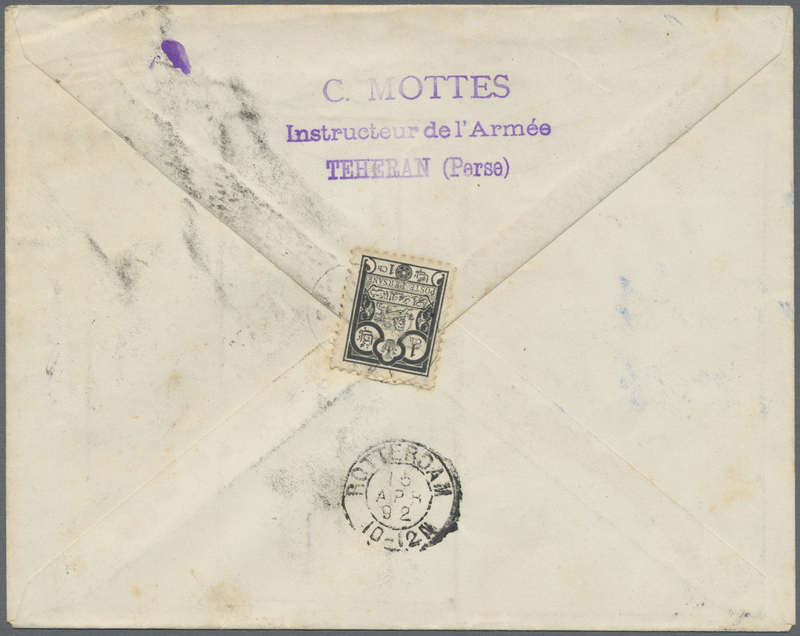 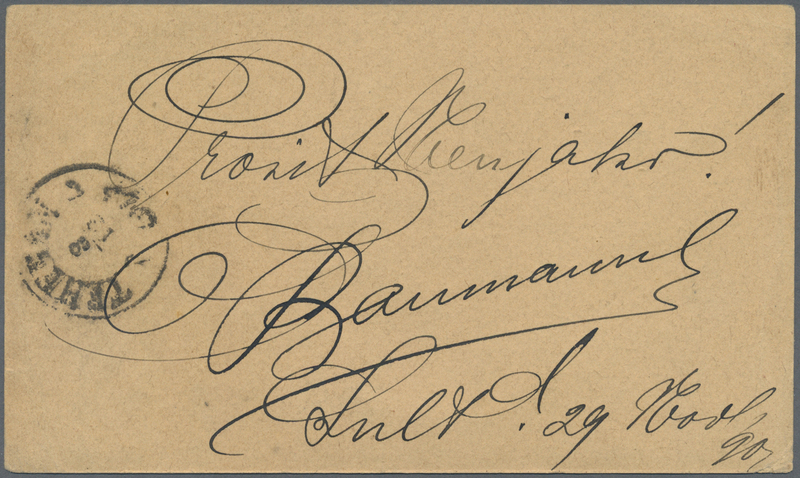 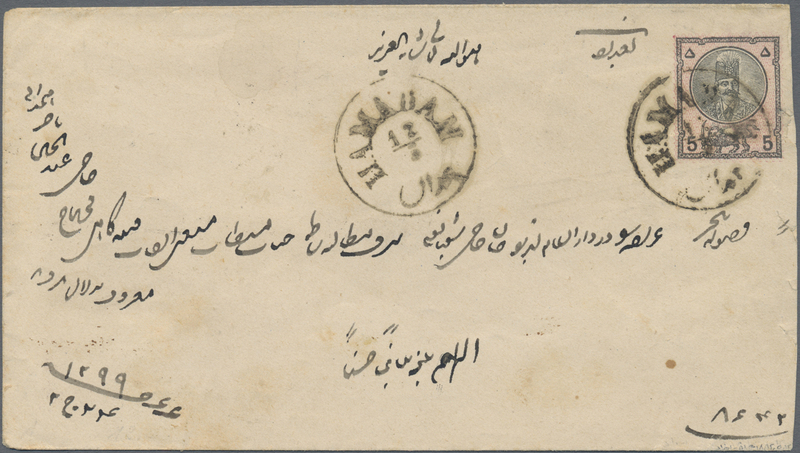 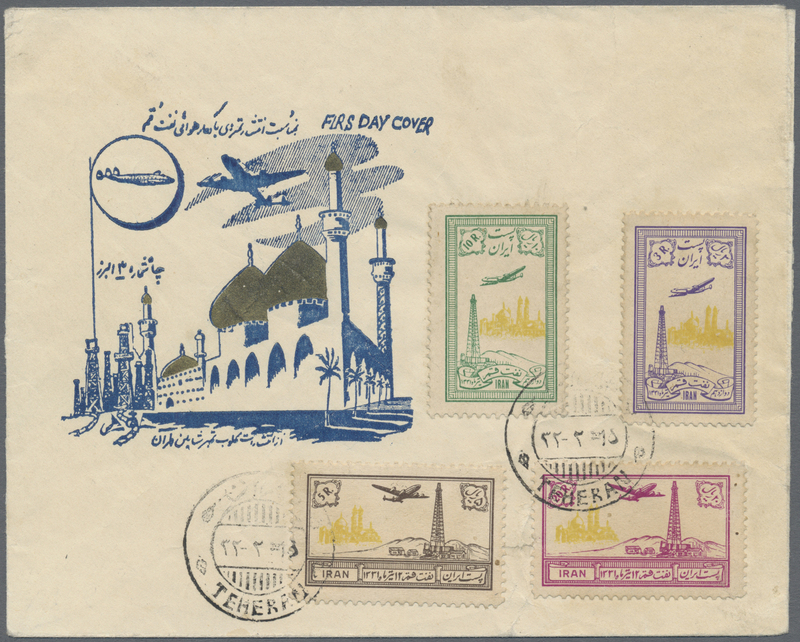 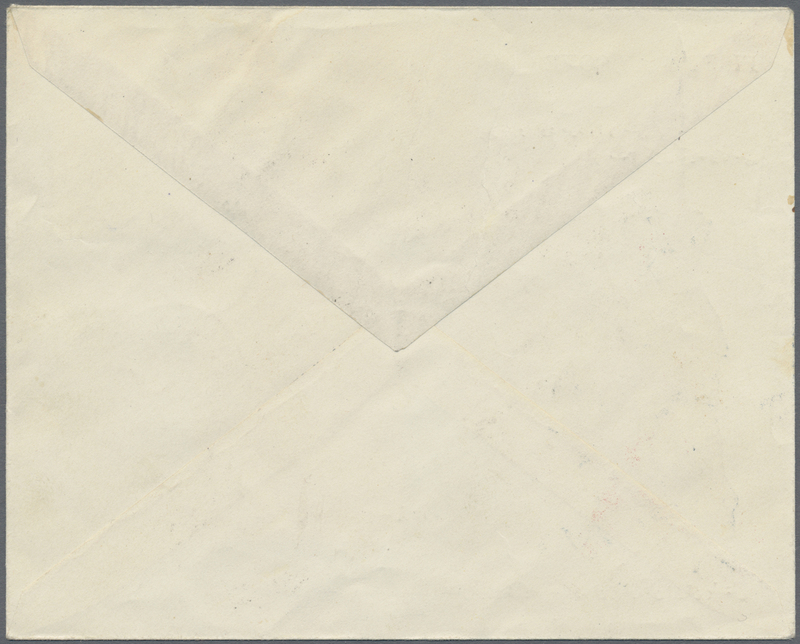 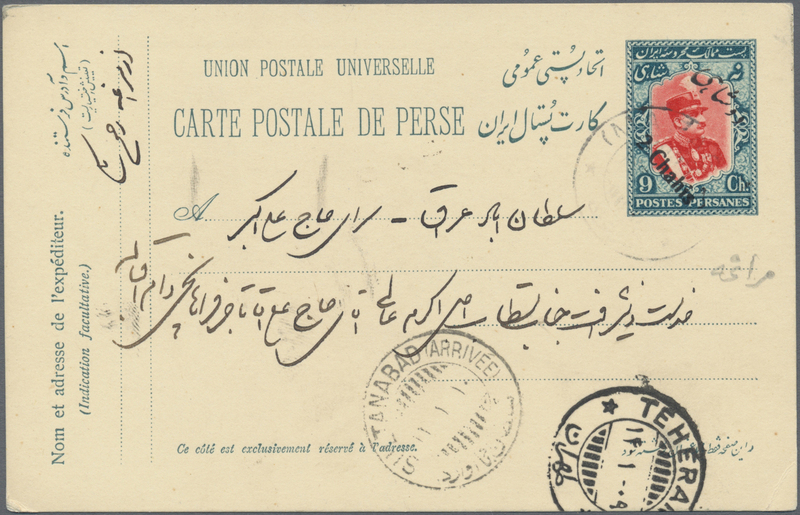 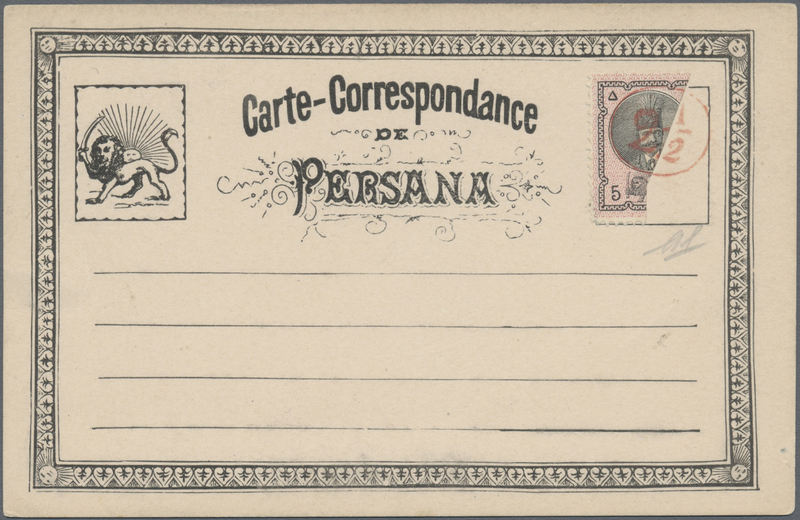 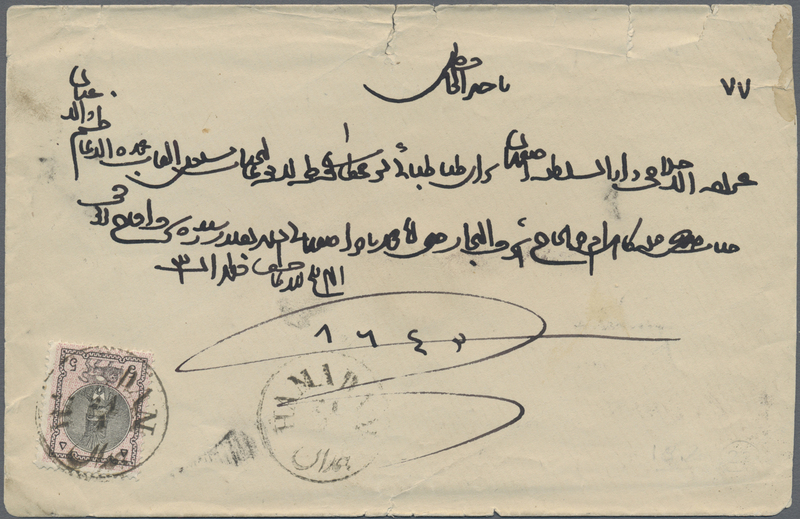 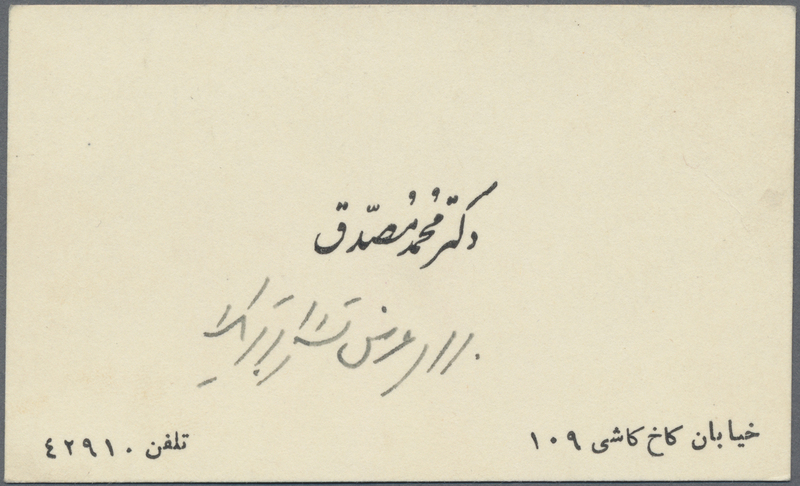 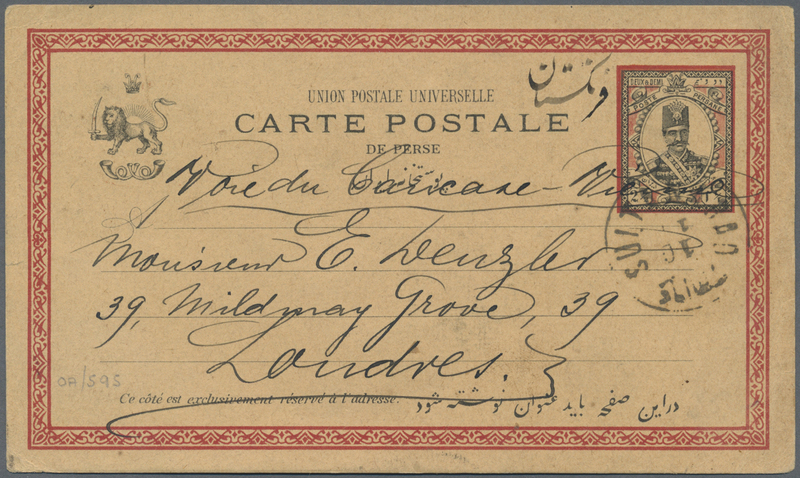 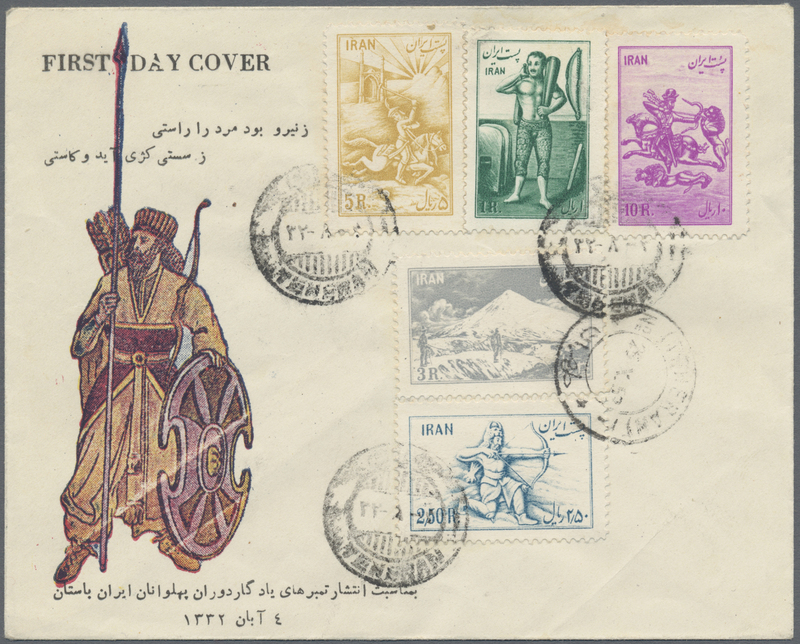 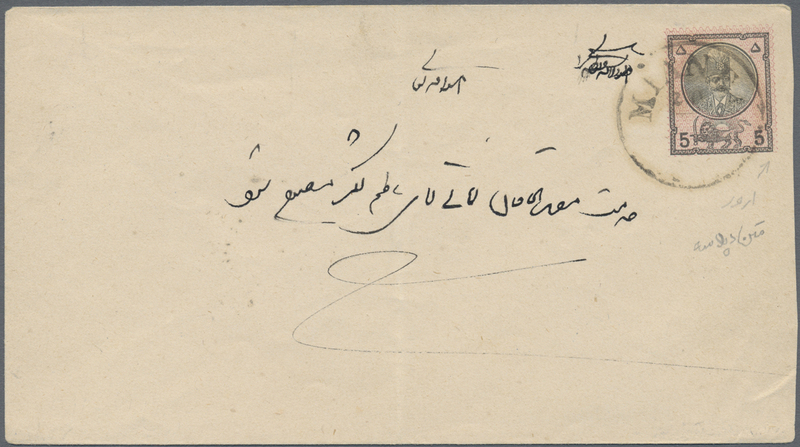 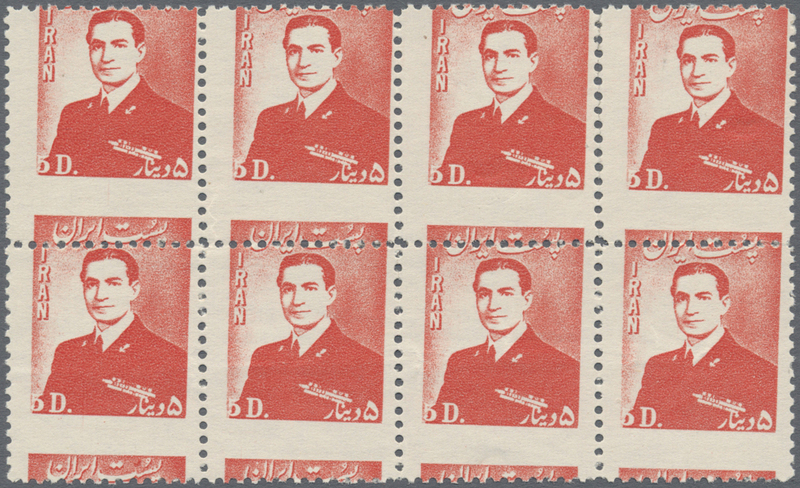 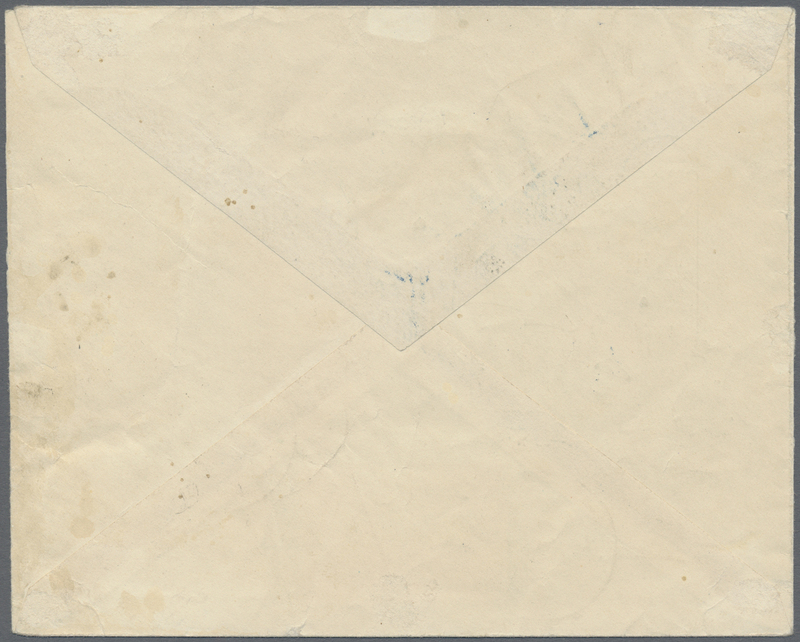 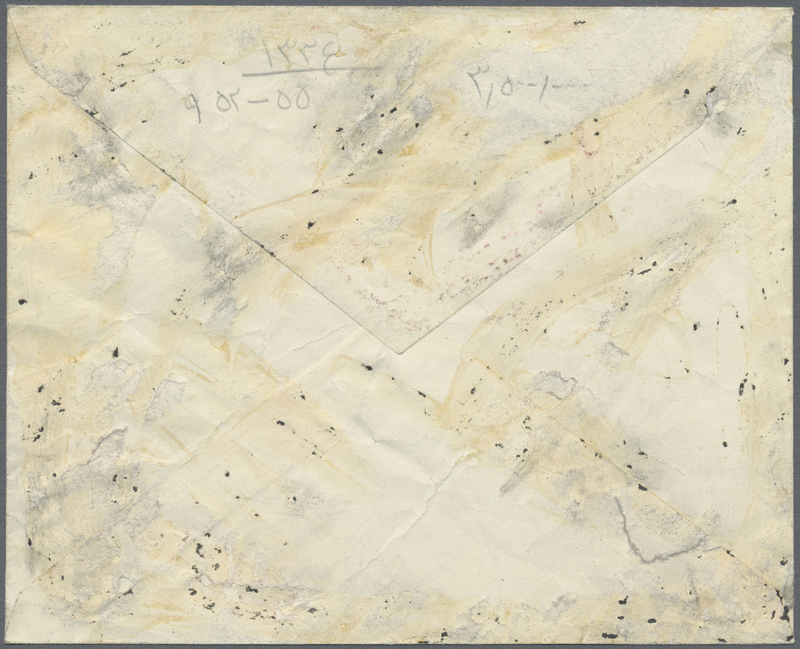 8499 Brief (cover) 1052, 1130 (2), 1131 1962, registered airmail cover "Cabinet Particulier de Sa Majeste Farah Pahlavi, l'Imperatrice de l'Iran" addressed to the local section of the Spanish Red Cross in Aviles, slight postal wear as to be expected.